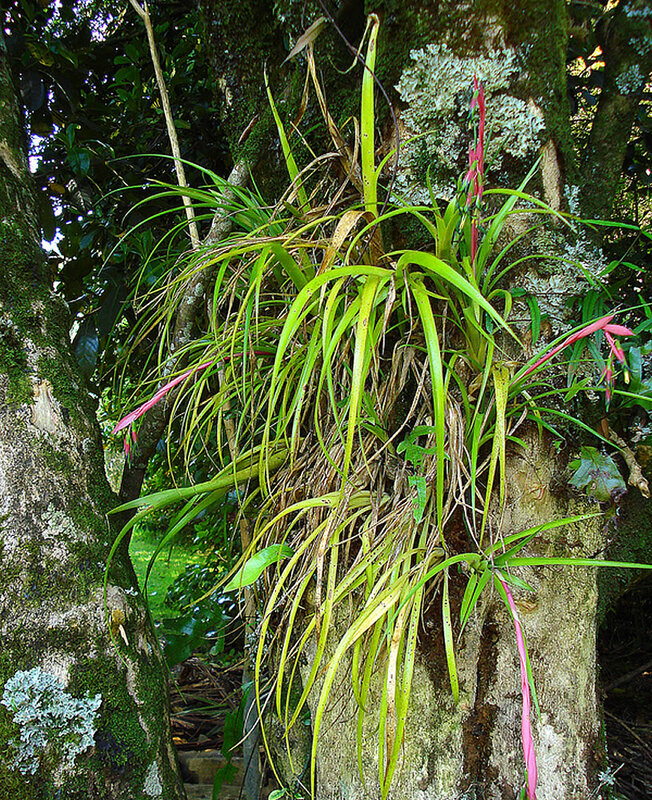 Distribution and habitat: Billbergia nutans is an epiphytic bromeliad native to Brazil, Paraguay, Uruguay, and Argentina. 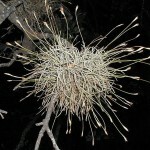 It is often found growing on tree branches in the South American rainforests. They have small roots, mainly used for anchoring themselves on trees, so these tree-dwelling plants gather moisture and nutrients through their leaves. 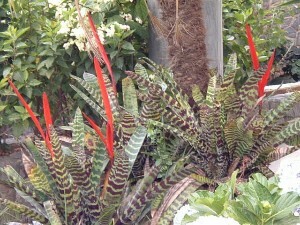 Description: Billbergia nutans is the most popular of all bromeliads. Young plants grow into upright rosettes. As the leaves age, they arch outward. They usually have only five to eight narrow stiff sward-shaped leaves arranged in a tube shaped rosette of which the upper half flares outward. Its arching leaves are 25-35cm (10-14 inch) long and about 1cm (0.4 inch) wide, leading to a graceful appearance which require some room to spread out. Their olive green colour may become reddish if the plant is grown in full sunlight. The 2cm (0.8 inch) long pendant flowers have pink, blue edged petals and they are backed with 5-8cm (2-3 inch) long pink bracts with papery-looking. The flowers appear only when the plant reaches its maturity, usually in 2-3 years. They will live for no more than a week or two. 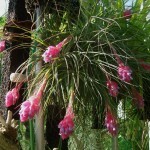 There is no regular flowering season for Billbergia nutans, which they may bloom at any time of year. Nor do they have an annual rest period. 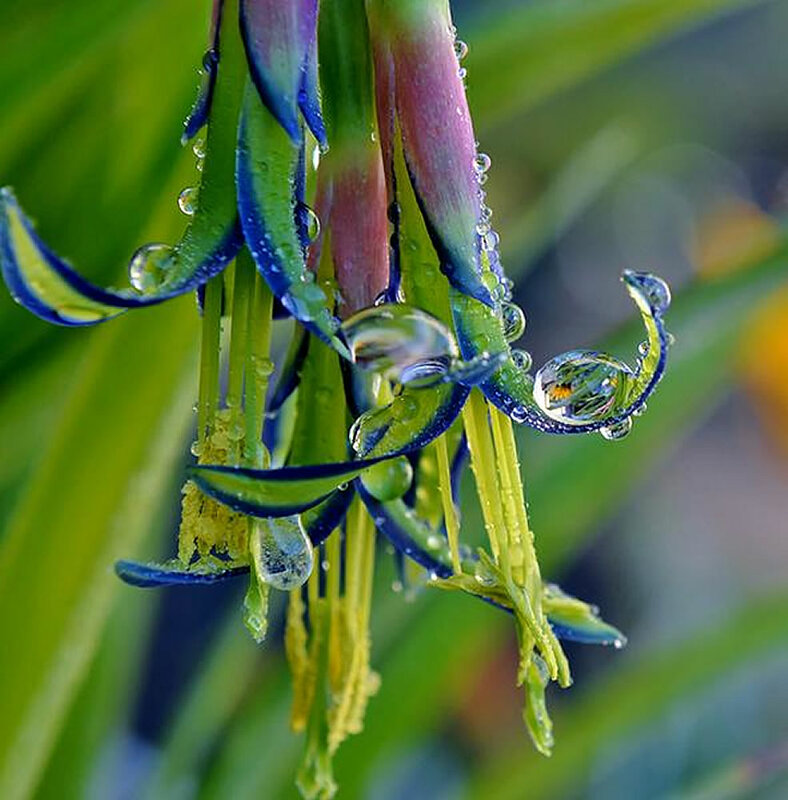 Billbergia nutans gets one of its common names, Queen’s Tears, from the drops of nectar that weep from the flowers when the plant is moved or touched. Because Billbergia nutans readily produces offsets that can be shared with friends, it is also commonly known as Friendship Plant. 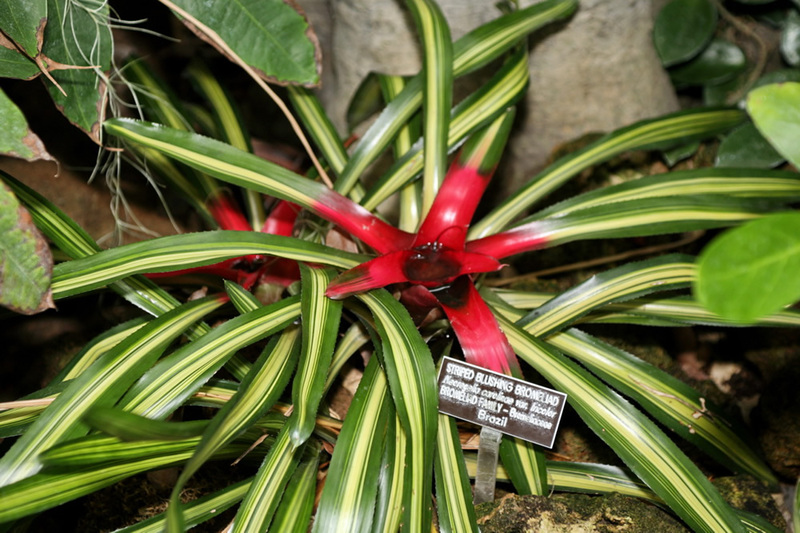 Houseplant care: Billbergia nutans plant is often used as an ornamental plant and it is the easiest to grow and most adaptable bromeliads for indoor use. Given an adequate amount of warmth, they will usually grow continuously. Light: Bright light with at least three or four hours of direct sunlight every day is essential for good leaf colour and regular flowering. 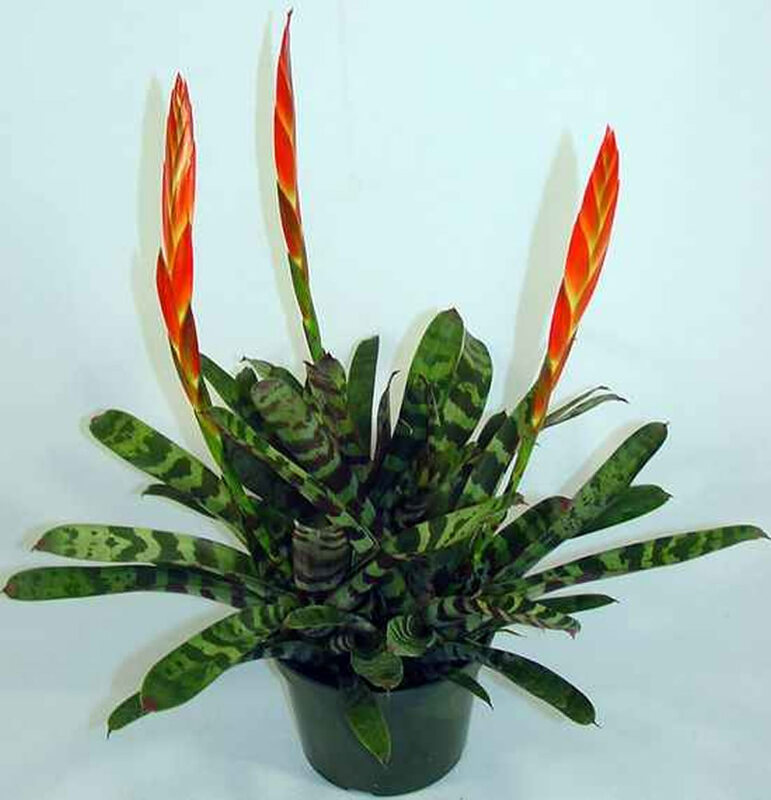 Temperature: Billbergia nutans grow well in normal room temperatures. Varieties of this species can also tolerate quite cold temperature – down to about 7°C (45°F). In the summer, this particular plant enjoys warm temperatures outdoors between 18 to 27°C (64-81°F). These plants will thrive in moderate humidity, but still benefit from being kept in a spot where they can be misted often to increase humidity. Watering: Throughout the year, water moderately, enough to make the potting mixture thoroughly moist, but allow the top centimetre (0.4 inch) or so of the potting mixture to dry out between watering. Water the center of the rosette and keep room-temperature rainwater or naturally soft water in its urn (centre of the rosette) at all times. Empty old water from the urn once a month by turning plants upside down and refill it with fresh water. Do not soak base of plant, which can lead to root rot. Feeding: Apply standard liquid fertiliser regularly, about every two weeks. Let the liquid not only to penetrate the potting mixture, but splash over leaves and lodge in central cups. Alternatively can be used a foliar fertiliser and spray it on the leaves. 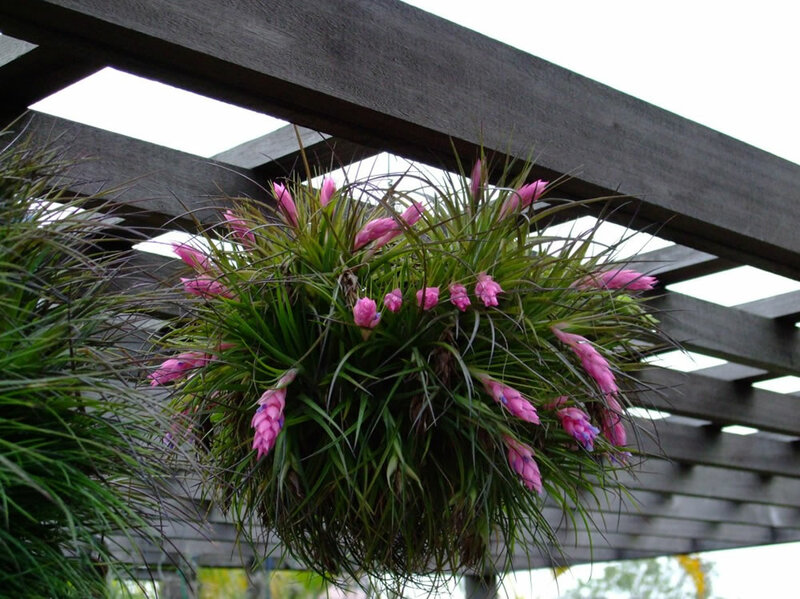 Potting and repotting: Billbergia nutans are the least demanding of bromeliads where potting mixture is concerned; they grow well in either the standard bromeliad mixture or in an equal-parts combination of soil based mixture and leaf mould. Because their roots are not extensive, they can be accommodated in relatively small pots. A 13cm (5 inch) pot will allow several rosettes producing several flowers heads to develop, but Billbergia nutans looks often best when is grown as single specimen with its tall tubular shape. It is best to plant these plants in heavy clay pots rather than plastic ones, to avoid the possibility of their being knocked over. 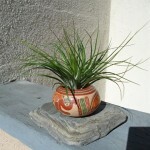 Young plants should be moved into pots one size larger in early spring when it appears necessary. Gardening: In southern areas it will live in the garden or decorate a patio or terrace and bloom for long periods with very little attention. Divide the clumps every few years. Give them a spray of water every so often in summer if it is dry. This bromeliad is hardy down to freezing temperatures, but prolonged exposure to low temperatures will affect the blooming season. 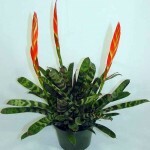 Position: During summer, provide partial shade to Billbergia nutans plants. At other times of the year, bright but indirect light is required for the health of this plant. Full summer sunlight can destroy the flowers. 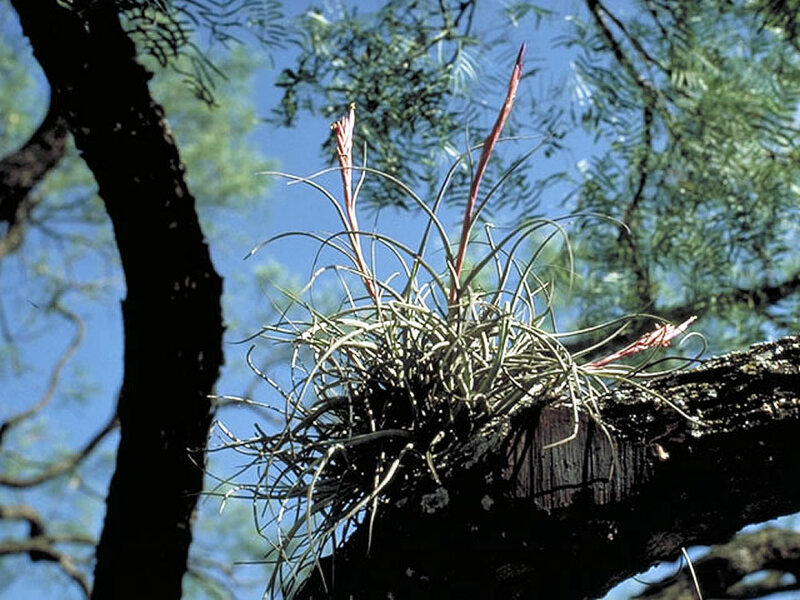 Soil: Being epiphytic, Billbergia nutans can be grown in the fork of a tree, where the cascading flowers can be well displayed, but can also be grown in the ground or in a pot. Like most bromeliads, it will survive in dry, shaded garden beds. The soil should be well drained and can consist from one part gardening soil to two parts perlite or tree bark mixture. 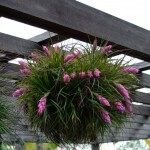 Use bromeliad mix or orchid potting mixture for potted plants. Irrigation: Billbergia nutans gathers most of its moisture from the air through the leaves and flowers. During the summer months, the leaves, flowers, and roots should be watered daily to keep them moist, but never soggy. Any flower cups pointing upward should be filled with water. Keep the center of the plant filled with water but allow the soil to dry out between each wetting. During the fall, winter, and cooler parts of spring, the plant should be misted every few days and watered enough to keep the soil just shy of dry. Fertilizer: During the summer months, offer this plant a balanced fertilizer once every other week. Flower cups can be filled with the fertilised liquid, and the leaves misted, as well as the soil watered. During other times of the year, reduce fertilisation to once a month. Propagation: Propagate in spring by means of offsets, but do not remove them until they are 10-15cm (4-6 inch) long and began to assume the characteristics of the parent plant. Very young offsets rarely root successfully. Plant offsets shallowly, retaining any roots that may already have developed, in small pots of bromeliad mixture and place them in medium light. It may be necessary to insert a thin stake as support for an offset until it develops enough roots to anchor it down. Make the potting mixture barely moist, allowing the top 2-5cm (0.8-2 inch) of the mixture to dry out between waterings. Firm rooting is likely to occur in eight weeks. Thereafter, treat the new Billbergia nutans plants exactly the same way as mature plants. 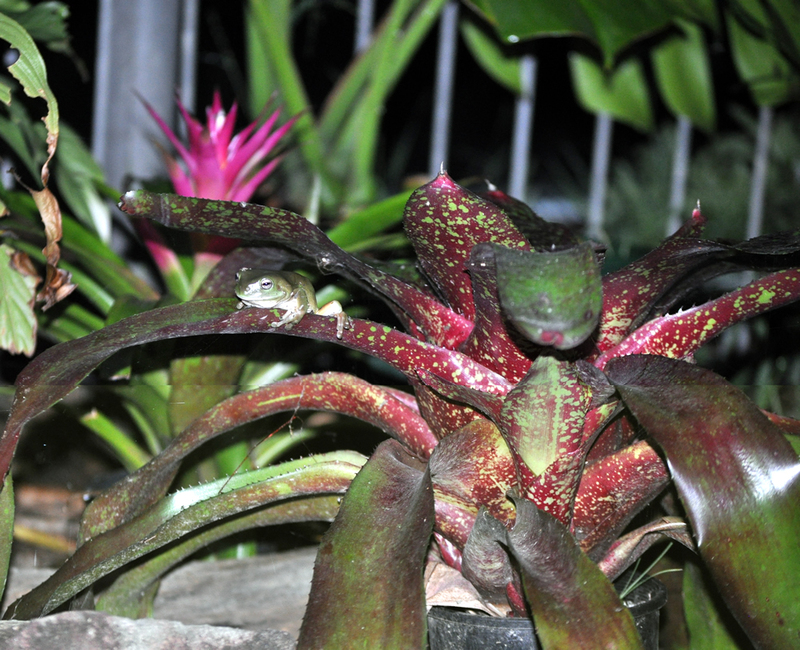 Problem: Billbergia nutans plants tend not to attract diseases and they never need pruning. 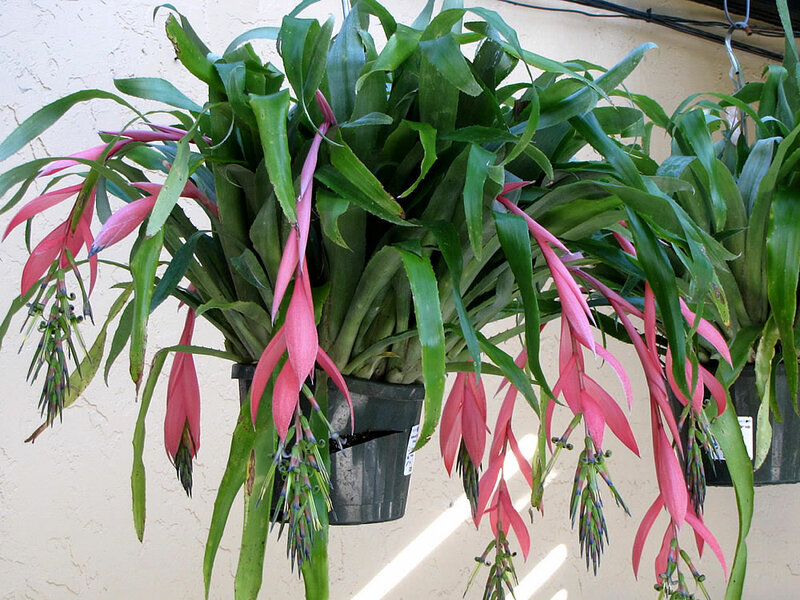 If mature Billbergia nutans do not produce blooms can be because the plant is not getting enough light. Treatment: Move the plant to a brighter location. This plant can be moved outdoors for the summer to a partially shaded spot. 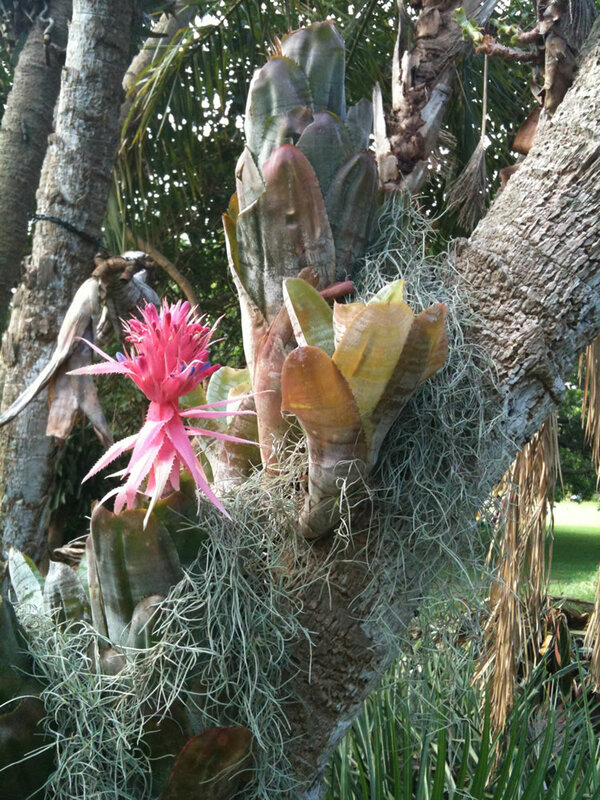 Encourage bromeliads to flower by adding a pinch of Epsom salts (magnesium sulfate) to the water or fertilizer. Additionally, place a ripe apple or a few apple cores around the plant and enclose the whole thing in a clear plastic bag for a week or two. Ripening apples produce ethylene gas that encourages flower buds to form. Keep the plant out of direct sun while it is covered with plastic to prevent it from getting too hot. Brown tips on leaves are caused by dry air. 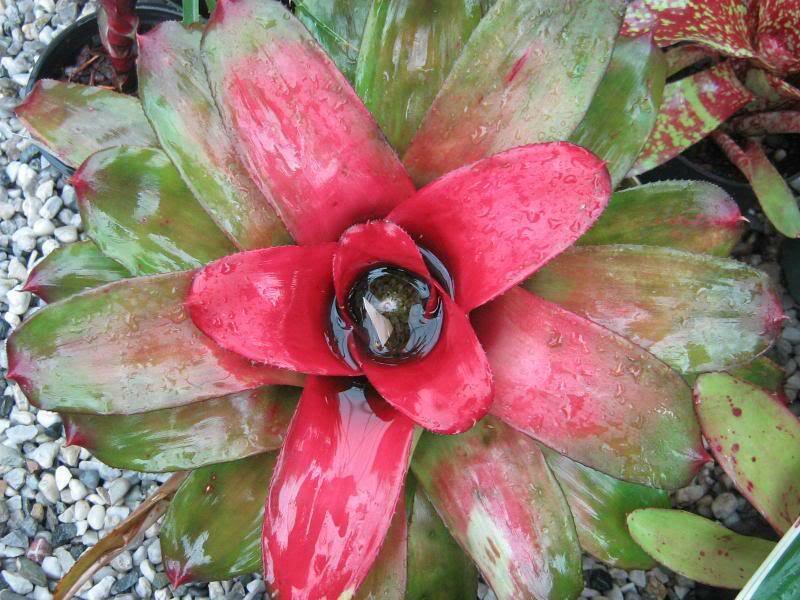 Treatment: Although billbergias are more tolerant of dry air than other bromeliads, they benefit from frequent misting with water to increase the humidity. 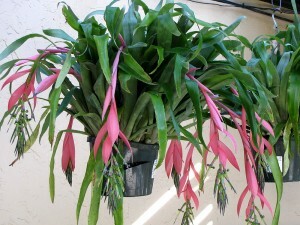 Uses and display: Billbergia nutans plant is suitable for growing indoors or as epiphytic bromedliad in a conservatory. 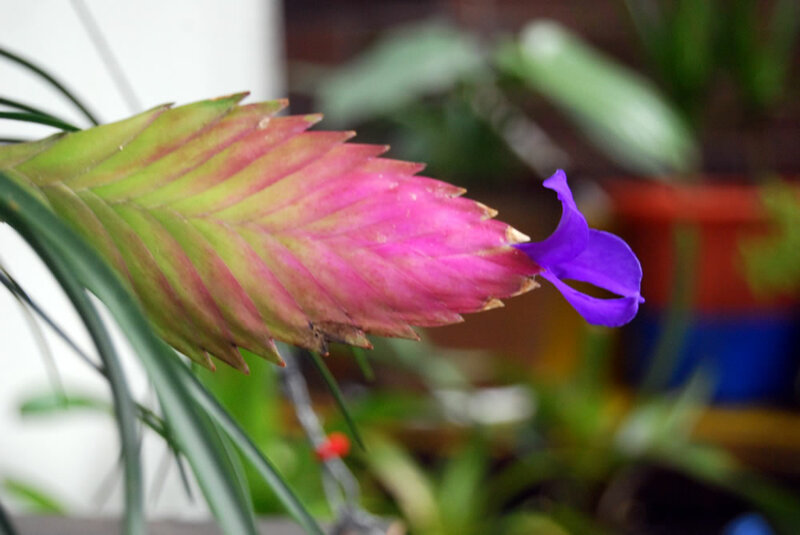 In warmer climates, the Billbergia nutans can be grown outdoors in well-drained soil or in pots on a terrace or patio or can be anchored in the fork of a tree, replicating its natural habitat. To look at its best, grow these plants in a hanging basket or suspended pot at eye level, where arching leaves and pendant flowers can be seen up close. 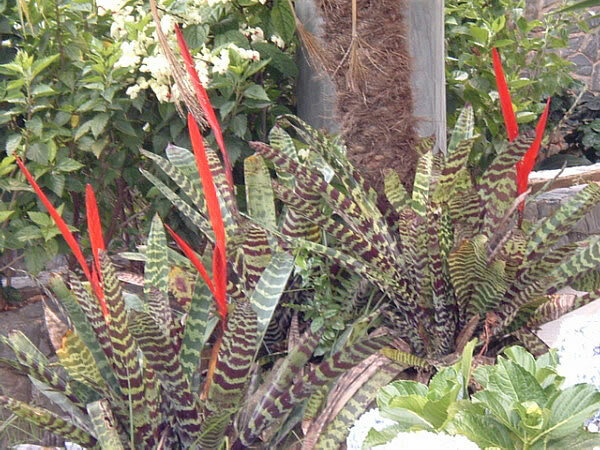 Distribution and habitat: Vriesea splendens is native to Venezuela and Trinidad, Guiana and Suriname. 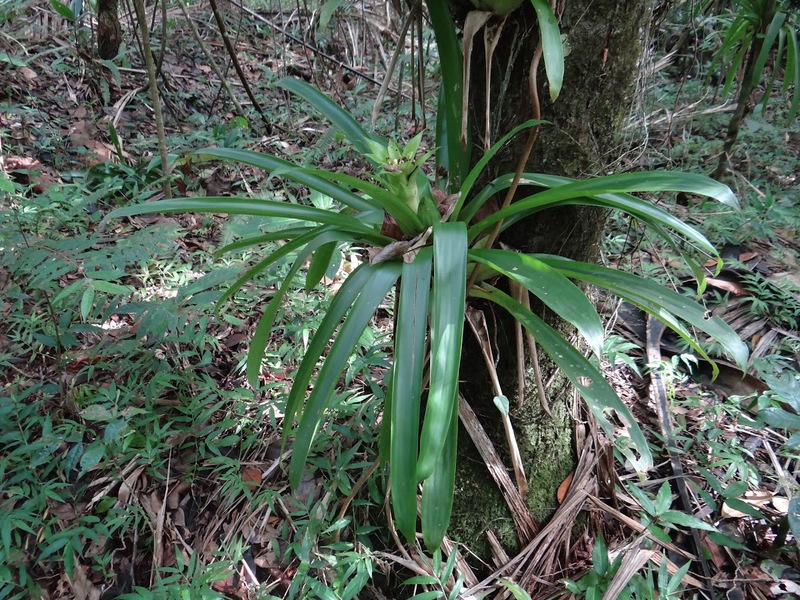 In its natural habitat Vriesea splendens is growing terrestrial among the roots of trees in soil rich in leaf mould, but mostly it is founded growing epiphytic in dense forests in shady wet areas. 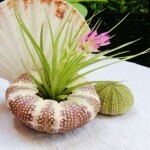 It has the typical bromeliad rosette form and water vase. Description: Vriesea splendens is prized for both its handsome foliage and its showy flower spikes, being one of the showiest and dramatic bromeliads. It has stiff, sword-shaped leaves with smooth edges arranged in a loose rosette that is capable of holding water in the rather cup-like centre. The rosette is composed of about 20 leaves 38cm (15 inch) long and 3-5cm (1-2 inch) wide, that are dark green with purple-black cross-banding. Like other bromeliads, Vriesea splendens do not flower until it is three to five years old. Its strongly coloured, usually erect, sword-shaped flower spikes, which can be produced at various times of the year depending on conditions, are very long lasting – an effect largely derived from brilliant bracts rather than the short-lived flowers. The flower spike up to 60cm (24 inch) tall is capped by a 30cm (12 inch) long flattened blade of brilliant red overlapping bracts; 3-5cm (1-2 inch) long yellow tubular flowers emerge from this. 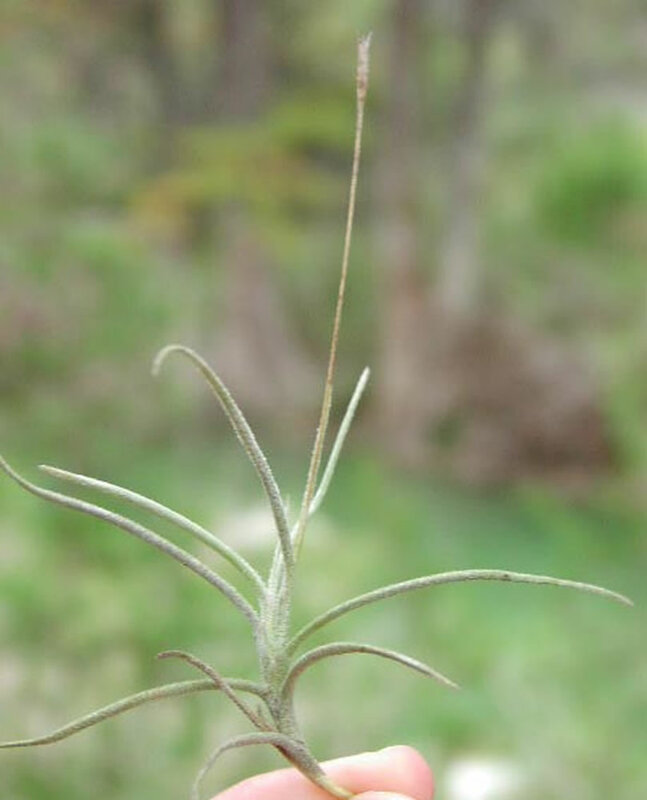 The spike persists for several months, after which the plant slowly declines while producing one or more offsets. There are many forms of Vriesea splendens, some with darker foliage, same with larger or differently shaped flower spikes. 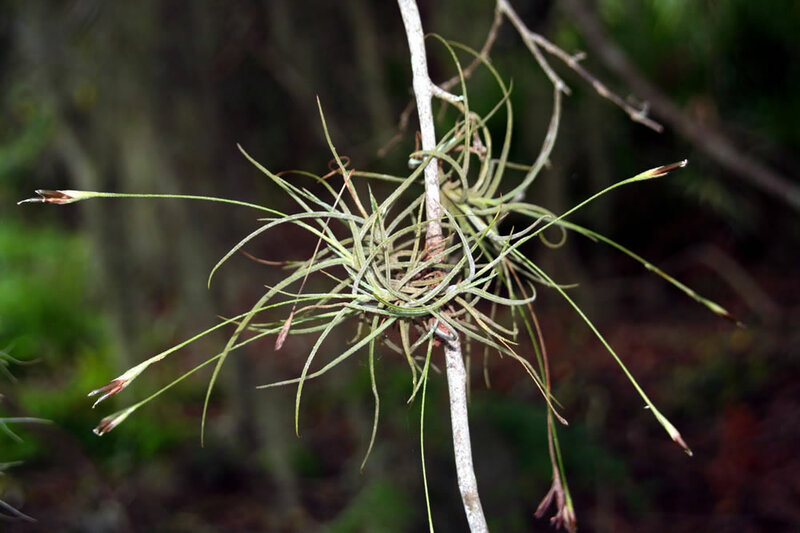 Houseplant care: Vriesea splendens are suitable subjects for growing on a bromeliad tree: the roots are wrapped in a ball of sphagnum moss and wired on to a dead branch or piece of driftwood. They must not be allowed to dry out and will need foliar feeding. These bromeliads are not as easy to grow as some other bromeliads, but they will succeed when provided with bright light, warm temperatures and moderate to high humidity. Light: Vriesea splendens must have bright light with three or four hours a day of direct sunlight, in order to flower. Do not subject them to scorching midday sun, however. 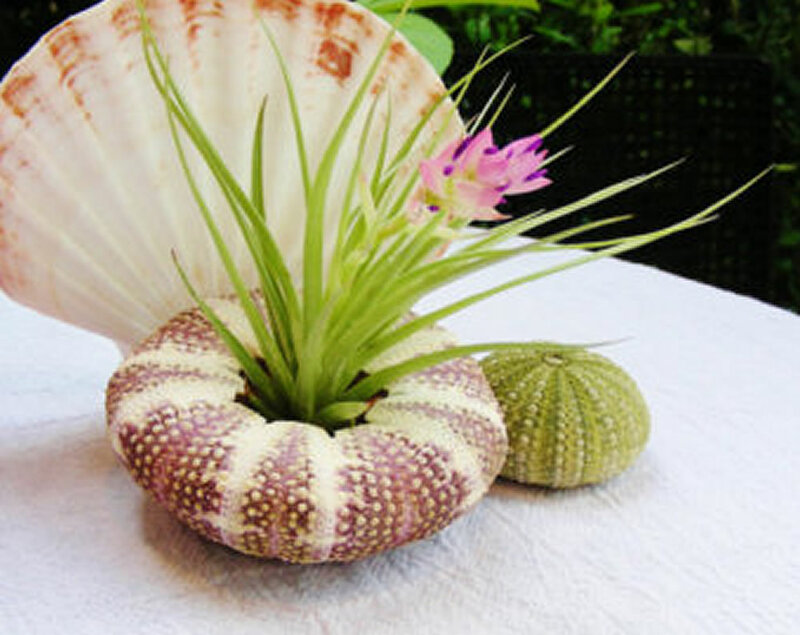 Temperature: Vriesea splendens need normal temperature and high humidity; to increase humidity it is recommended to place pots on trays of moist pebbles. Protect this bromeliad from temperatures below 10°C (50°F). Watering: Water actively growing plants plentifully by filling the central cup of the rosette until water spills over into leaf axils and seeps through to the potting mixture. During the short day months Vriesea splendens may rest and they should watered just enough to make the potting mixture barely moist. Refill the water vase every two weeks with fresh water. Spray leaves weekly. Use soft water if possible. Allow water to stand for several hours before using it. Feeding: Give all actively growing plants half-strength liquid fertiliser about once a month. Apply the fertiliser to both the potting mixture and central cup. Do not fertilise during the rest period. 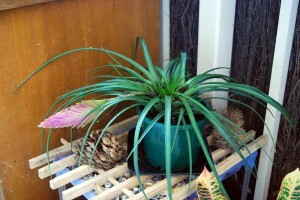 Potting and repotting: Use the mixture recommended for bromeliads. Two possible potting mixture consist of equal parts of coarse leaf mould and peat moss or equal parts of lime-free, soil based mixture and peat moss. 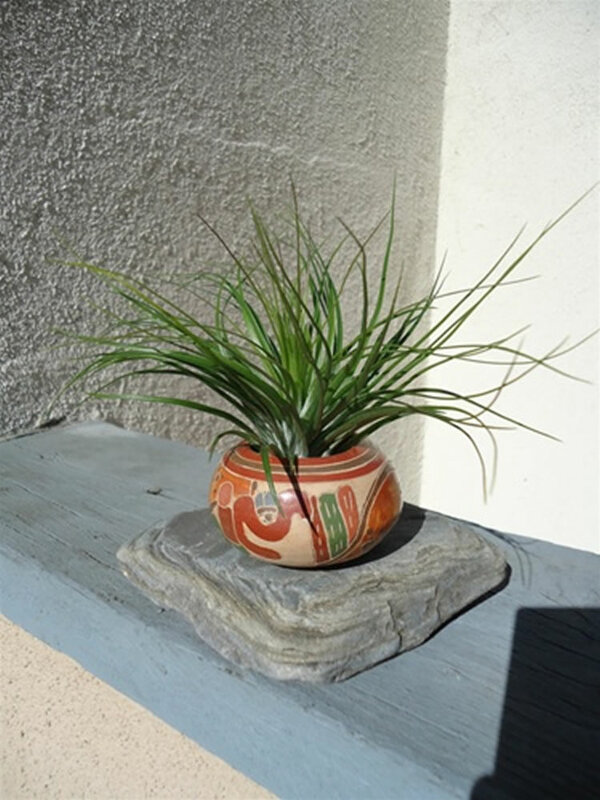 Repot Vriesea splendens only when roots fill their pots – every two or three years – this is best done in spring. The largest pot size required is 13cm (5 inch). When reppoting these plants, do not pack the potting mixture too firmly; roots cannot penetrate heavy soil. Gardening: Vriesea splendens prefer a sunny to half-shady situation on moderately moist soil. They are hardy to zone 10. It can be planted in the ground in a humus rich soil or attached to the side of a fern tree. In summer the plants prefer moderate humidity and need protection from direct sunlight. 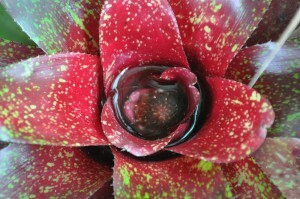 Bring this bromeliad inside during winter months. Propagate a new plant from the pups when the parent plant is close to expiring. Propagation: Around flowering time, Vriesea splendens will produce offsets either from leaf axils or around the base of the rosettes. A basal offset should be from 8-15cm (3-6 inch) long (depending of the mature plant size) before being detached with a sharp knife; retain roots if they have already been produced. Plant the offset in an 8cm (3 inch) pot of moistened standard mixture for bromeliads, enclose it an plastic bag and keep it in warm room in bright filtered light until roots are established (in about four to six weeks). There after, treat the young plant as recommended for mature Vriesea splendens. Offset arising from leaf should not be detached but allowed to grow in natural way. They will take over from the parent (which after having flowered, slowly dies) over a period of about a year. Also Vriesea splendens can be propagated from seed. The seeds need to be freshly gathered since they lose their viability quickly. Sow the seeds in spring and use shallow pan or half-pot filled with mixture of two parts of peat moss to one part of coarse sand. Sprinkle the seeds thinly and evenly over the surface, pressing them down lightly without burying them. After thoroughly moistening the potting mixture, place the container in a plastic bag or heated propagating case. If it is kept at a temperature of about 24-27°C (75-81°F) fresh seeds will germinate in a week or two. Leave the seedling still enclosed in the bag or case, in a warm position that gets bright filtered light until they have made three or four leaves. Once the leaves have appeared, gradually allow more air to the bag or case to accustom the seedlings to normal room conditions over a period of 7 to 10 days. After the seedlings are fully uncovered, begin to water them moderately allowing the top centimetre (0.4 inch) or so of the potting mixture to dry out between waterings; start feeding once a month of liquid fertiliser at half strength. When the seedlings have made at least six leaves, pot each young plant in a 5 or 8cm (2-3 inch) pot of one of the recommended potting mixture for adult bromediads and treat them as mature plants. Brown patches on leaves may be caused by exposure to direct sunlight. Also, leaf blotches can be a sign of a fungal or bacterial infection. Bacterial spots are rather angular and yellow-rimmed while fungal spots usually are rather rounded with an area of fruiting bodies. Treatment: Destroy affected parts, additional apply fungicide in fungal infection cases. Brown tips on the leaves usually indicate insufficient humidity in air or the bromediad vase has not been filled with water. Treatment: Remove infected plants. Avoid further infection by improving drainage and avoiding over-fertilisation. Scale insects that sit on the undersides of the leaves and excrete honeydew. Treatment: Scale insects can be controlled with insecticide. Rotting at the base may be due to overwatering of the potting mixture. Rotting at the base, if the plant has flowered, may be due to natural death of the parent rosette, however. Uses and display: Vriesea splendens is suited as container plant and as indoor plant. 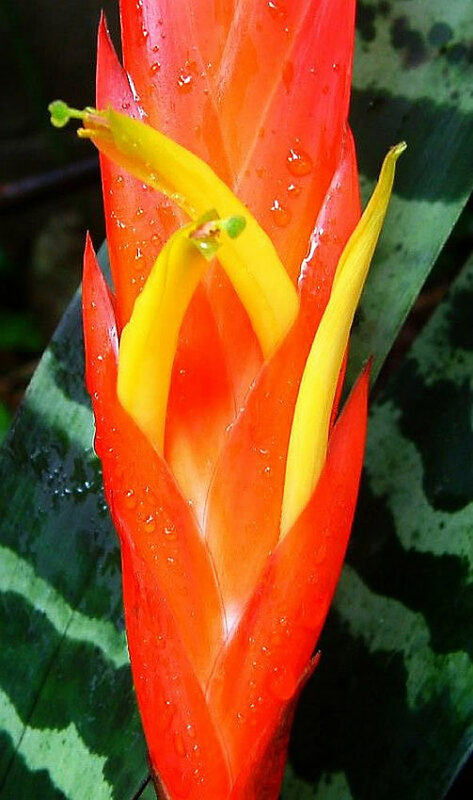 The vibrant leaf colors make this bromeliad a unique focal point, even when the plant is not in bloom. Since the spread of this plant is wide, a good location is a raised platform or plant stand, with other low-light plants used as accents beneath. It is widely used as a container plant in indoor commercial sites. 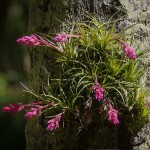 Vriesea splendens can be grown as an epiphyte plant mounted on a piece of bark or a tree branch. 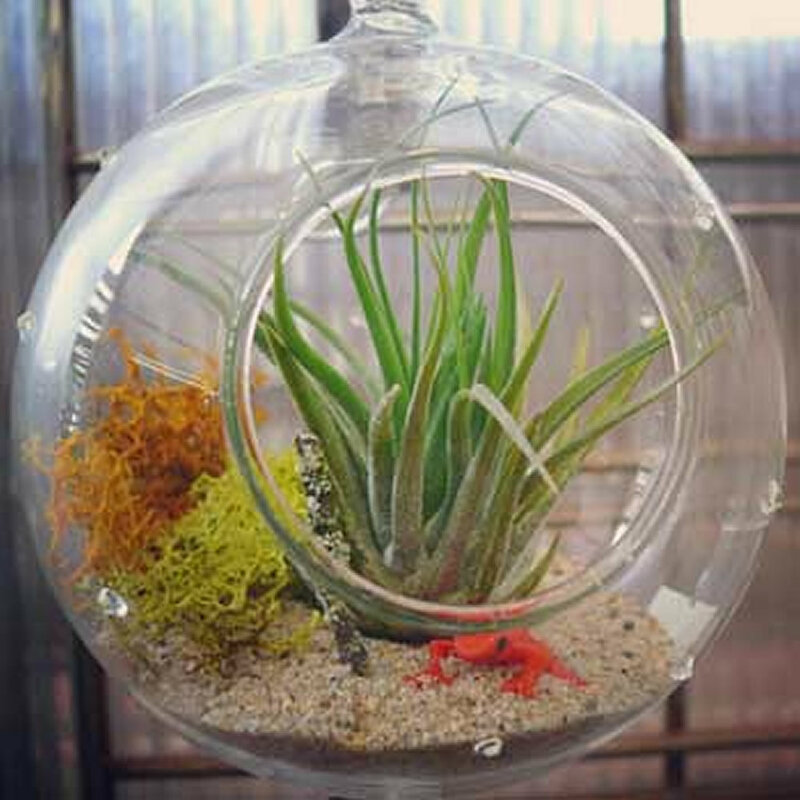 The young Vriesea splendens arise from seed can be used for bottle gardens or terrariums as this bromeliad is a slow grower. Distribution and habitat: Neoregelia carolinae is a herbaceous monocarpic (it fructifies only once, than dies) evergreen perennial that is native to tropical rain forests in southeastern Brazil. 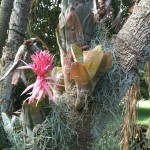 This bromeliad is an epiphyte (grows on other plants, but is not parasitic) that in the wild typically grows soilless. Narrow, leathery, shiny, spine-tipped, lance-shaped leaves form a water holding cup in the centre of the plant where water and decaying debris are collected. The leaves absorb dissolved nutrients from this central cup satisfying the nutritional needs of the plant. The leaf-vase bursts into glowing colour, effect obviously designed to attract fertilising insect to the tiny flowers, which are almost invisible, barely showing above the water collected and stored in the well of the leaves. Description: Neoregelia carolinae and its varying forms are rarely more than 22cm (9 inch) tall, with shiny, medium green leaves about 30cm (12 inch) long and about 5cm (2 inch) wide. During the flowering period which can occur at any time of year, there are striking changes of colour in the leaves. The inner leaves of the rosette take on a reddish hue. The remarkable colour remain attractive for several months. When a plant comes into bloom, it usually assumes a flatter shape and the colors intensify. Inflorescence is violet to lavender and appear in the socket centre of the leaf rosette. The clustered flowers held low in the centre of the vase look like a cute miniature water garden. Only a few are open at any given time, but there are many of them and they open over an extensive period of time. It does not have showy flowers like some members of the bromeliad family: instead it has stunning foliage, with the centre of its vase being brilliant coloured at flowering time and for some months afterwards. 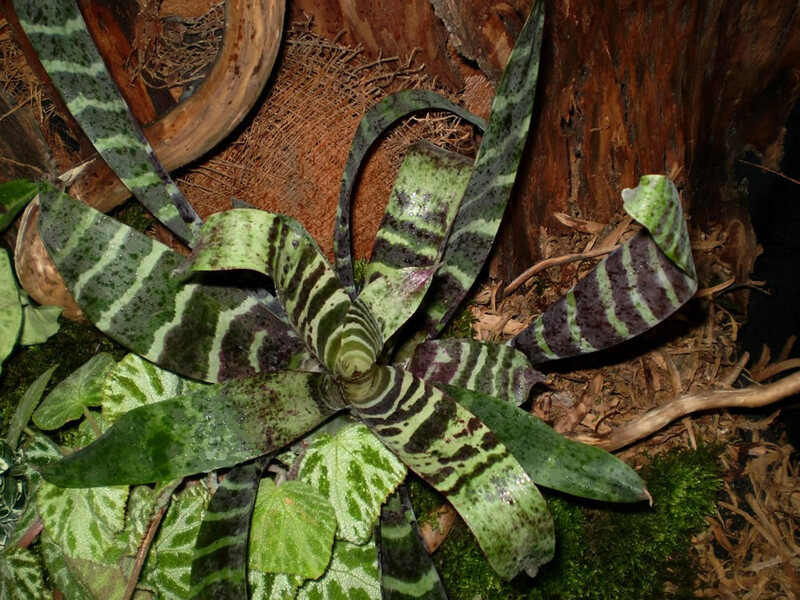 Houseplant care: Neoregelia carolinae can be grown in pots or mounted on wood or cork bark. When mounting a plant, start with a pup not a mature plant. Plants potted in a mix will form a root system that is adapted to taking up water and nutrients from the soil. 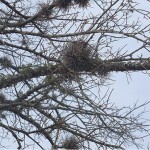 Plants mounted on wood or bark will put out a set of tough strong roots adapted to holding the plant secure, but they will not be able to absorb water and nutrients. Light: Neoregelia carolinae like bright to almost full sunlight. These bromeliads appreciate some morning or late afternoon sun, but will not tolerate direct mid-day sun in hot summer climates. They stay more compact and develop more intense color when grown in bright light. These tough leather leafed plants will take the most sun than other bromeliads, but watch them carefully and move them to a lower light location if the leaves start to bleach out. Temperature: They prefer temperatures in the range from 10 to 32°C (50-90°F). 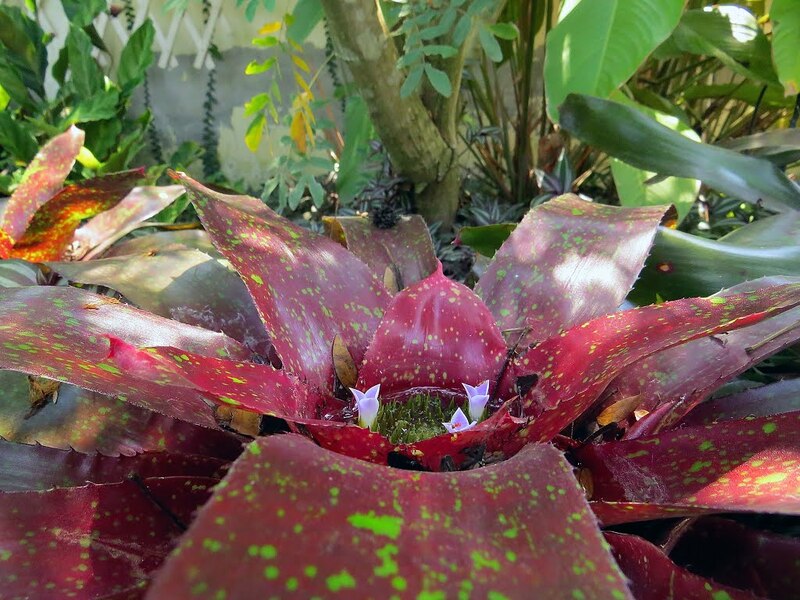 High temperatures do not usually harm Neoregelia carolinae, but they do lose some of their bright color. The color will return when the nights begin to get cooler. These bromeliads grow best with high humidity. Set container on a pebble tray in order to increase humidity. Water: Potted Neoregelia carolinae should be regularly watered, but not overwatered them. Pour the water through the funnel of leaves rather than directly on the potting mix. Use rain water when is possible. Stagnant water in the cup is an excellent breading ground for unwanted insects such mosquitoes or bacterias with bad odors. Empty the cup or flush it out with large quantities of water on a weekly basis to avoid disease and insect problems. Fertiliser: Well established plants growing in good light can be fertilised monthly with a highly diluted general purpose fertiliser during warm weather, but for the most part use very little if any fertilizer to keep good leaf color. Potting and repotting: Use a soil based potting mixture consisting of equal parts of leaf mould, peat moss and sand. Small plants should be moved to pots one size larger in spring. Neoregelia marmorata, however, are unlikely to require pots bigger than 13cm (5 inch) size. Propagation: After blooming the mature plant goes into a slow decline, but small plants called pups will develop at the base of plant. When a pup is about half or more the size of the mature plant it can be removed and mounted or it can be potted in its own pot. Pups root quickly in the spring and will usually bloom in 1-3 years. If the pups are not removed, remove the original plant when it dies and allow the pups to grow as a clump. For those who like adventure, Neoregelia carolinae can be grown from seed, but this is a slow process that can take many years. Rot may develop if soil is kept too moist. Over fertilisation can lead to over-sized, lanky, green, plants that are more susceptible to insect and disease damage. If bromeliads are crowded and there is little air circulation can develop brown soft bodied scale or the black tea scale infestation. Treatment: A treatment or two of insecticidal soap will usually bring the brown scale under control. If a bromeliad is infected with black tea scale, it can be destroyed and only an appropriate insecticide will eradicate these insects. Occasionally these bromeliads will be attacked by a fungal infestation. Treatment: Recovery from fungal infestation is rapid when treated early with a fungicide. 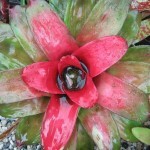 Use: Neoregelia carolinae is a houseplant for warm and humid areas. Neoregelia carolinae should be displayed low down where the eye can see into the vivid centre of the plant. Neoregelia carolinae ‘Marechalii’ is the most compact variety, has slightly shorter, broader leaves and the centre of the rosette turns carmine-red when the plant is about to flower. Neoregelia carolinae ‘Meyendorffii’ has copper-tinged olive green leaves that become dark maroon in the rosette centre at flowering time. Neoregelia carolinae ‘Tricolor’ is the most popular variety. 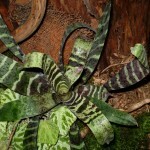 It has leaves that are striped in white and rose-pink, as well as green. 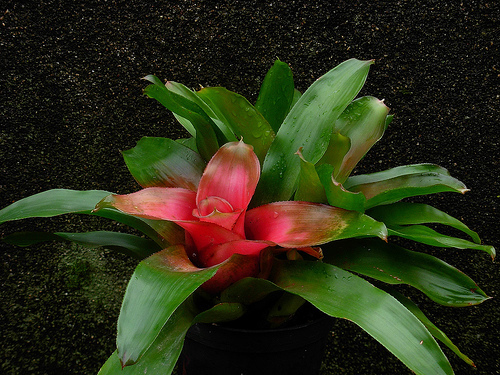 As this bromeliad matures, the whole leaf becomes suffused with pink and with the approach of flowering time the central leaves of the plant turns brilliant red. Distribution and habitat: Neoregelia marmorata is an evergreen perennial endemic to Brazil. They can be found from sea level to 1500m (5000 feet), usually growing on trees and shrubs where they receive some shade. Neoregelia marmorata have a set of leaves that form a water holding cup in the center of the plant. The cup collects water and decaying debris that satisfy the plant’s nutritional needs when the leaves absorb dissolved nutrients. Description: Neoregelia marmorata are bromeliads with brilliantly coloured foliage which is arranged in a flattish rosette shape. It has leaves up to 38cm (15 inch) long and about 6cm (2 inch) wide, which are light green heavily marbled on both sides with reddish brown. Flowers are pale lavender-blue, small and contained in the cup. Only a few are open at any given time, but there are many of them, and they open over an extensive period of time. Neoregelia marmorata are not usually grown for their flowers, but for their leaves. High light levels increases the colouring till the maroon turns wine red and almost glows. It has no clearly-defined rest period; they normally grow slowly and more or less continuously throughout the year. Houseplant care: Neoregelia marmorata is not difficult to grow, but it is somewhat more dependent on strong light to develop deep, vivid colors in its leaves. 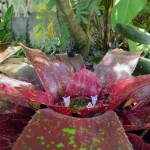 This bromeliad can even withstand some gentle direct sunlight, such as eastern morning exposure. Light: For compact, briliatly coloured foliage are dependable flowering these plants need bright light with some direct sunlight. Temperature: Neoregelia marmorata will thrive in normal room temperatures. They cannot tolerate temperatures below about 10°C (50°F). Provide a humid atmosphere by standing pots on trays of moist pebbles and mist-spray plants daily when they are being grown in warm, dry conditions. Water: Water the plants moderately, enough to make the potting mixture moist throughout, but allow about one-third of the mixture to dry out between waterings. The cup-like centres of rosettes should also be filled and kept topped up with water; keep this water fresh by carefully upturning the plant about once a month, draining out the old water and replacing it. Avoid tap water in the central cup if possible and use rain water. Fertilising: Give Neoregelia marmorata half strength liquid fertiliser every two weeks, applying it not only to the potting mixture but over the foliage and into the centre of the rosette. Do not overfeed these bromeliads. Propagation: Spring is the best time to propagate. Use young rosettes produced near the base of plants or on the ends of stolons. Basal rosettes may already have rooted down into the potting mixture; when carefully detaching them, keep as much root attached as possible. Place each basal rosette in an 8cm (3 inch) pot of a moistened equal-parts mixture of peat moss and sand, enclose it in a plastic bag and keep it in warm place where it will get medium light. After the rosette is well rooted (in about six to eight weeks), transfer it to an 8cm pot (3 inch) of recommended potting mixture for mature Neoregelia marmorata. Thereafter treat it as mature. Problems: Properly spaced plants growing in a well ventilated area are seldom bothered by disease or insects. 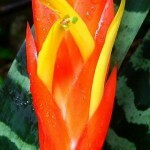 If bromeliads are crowded and there is little air circulation scale infestation can develop. The two most common types of scale are the brown soft bodied scale and the black tea scale. Occasionally these bromeliads will be attacked by a fungal disease. Treatment: Recovery from fungal disease is rapid when treated early with a fungicide. 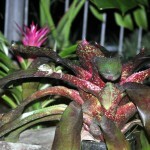 Usage: Neoregelia marmorata is ideal for landscaping or on a balcony. They require very little maintance and are well suited to shady tropical gardens where a splash of colour is required. 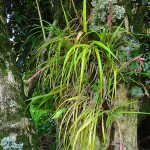 Grow this epiphytic bromedliad as a houseplant or in a conservatory in special compost. Distribution and habitat: Dyckia fosteriana are striking rare plants native to central South America, primarily Brazil. The genus Dyckia consist of 120 saxicolous (living on or around rocks) or terrestrial (growing in the ground) bromeliads species, although most are strictly terrestrial and all do well when grown as terrestrials plants. Description: Dyckia fosteriana are spiny, stemless bromeliads resembling prickly succulents. It has shiny, stiffly arching, dull grey leaves up to 22cm (9 inch) long and 1-2cm (0.4-0.8 inch) wide, viciously armed with tiny hooked spines along the edges. In bright sunlight the leaf colour changes to rich metallic bronze. The leaves grow in a tight rosette. In the spring bell shaped flowers in orange-yellow colour and 2cm (0.8 inch) long appear on 22-30cm (9-12 inch) long, slender flower stalk. 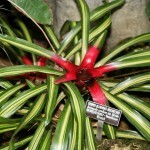 These flower stalk are rising from a side of a mature rosette – not from the centre as on other bromeliads – meaning that the plant is not dying after flowering as most other bromeliads does. Dyckia fosteriana generally form new rosettes rapidly, building up into relatively large cluster. It spread little more than 30cm (12 inch) or so. Houseplant care: Whenever possible, stand the Dyckia fosteriana in a sunny position outdoors throughout the summer months. Do not expose them to outdoors brightness suddenly, however. Instead give them a little more sunlight each day over a period of 7 to 10 days. Bring plants indoors again in about early autumn. Dyckia fosteriana will withstand more neglect than almost any other commonly cultivated plant and still pup and bloom every year. Their only demand is a little water and a lot of sunshine. Light: Grow Dyckia fosteriana in direct sunlight for strongest leaf colour and for short, sturdy growth. Temperature: Dyckia fosteriana flourish in hot, dry conditions in the wild, so they are able to withstand dry indoor heat. They have no definite resting period, but grow steadily throughout periods of warmth. However they can tolerate quite cool temperatures, even as low as 10°C (50°F). Watering: Dyckia fosteriana are well able to withstand long periods of drought (as well as short periods of general neglect). They do best, however, if watered moderately, enough to make the entire potting mixture moist at each watering and allowing the top couple of centimetres of the mixture to dry out before watering again. In areas where the quantity of sunlight is considerably reduced in winter, Dyckia fosteriana should be kept quite cool during the months of low light. At such times water them sparingly (no more than once a month, giving just enough each time to keep the potting mixture from drying out. Fertilising: Apply a standard liquid fertiliser to these plants once a month during spring, summer and autumn. Poting and repotting: Use stout gloves when repotting these plants and handle the leaves with great care. Stiffly arching leaves are liable to break off suddenly if they are not treated with considerable care. Use soil based potting mixture with the addition of a one-third portion of coarse sand to ensure good drainage. Pots should also have a shallow layer of clay-pot fragments or other drainage material on the bottom. Move the Dyckia fosteriana into pots one size larger in the spring whenever their roots have covered the entire surface of the potting mixture. The largest pot size needed will normally be 12-15cm (5-6 inch). Garden Culture: In an outdoor setting with considerable sunshine, Dyckia fosteriana plants may be a welcome addition to the garden. They prefer temperatures in the range of 4-32°C (40-90 °F), but they will withstand lower and much higher temperatures. They will not be harmed by freezing weather if they are planted in the ground and given minimal protection. Position: They like full sunlight. The 50% shade is probably the least amount of sun that they can have and still flourish. Soil: Lightly amend heavy clay or sandy soils with organic matter. Water: Although they will tolerate drought, they thrive on frequent watering while actively growing as they tend to dry our rapidly during the summer time. However keep plants on the dry side during cold weather or during periods of reduced light. Propagation: Dyckia fosteriana can be propagated in spring from offsets which appear in large number around the base of these plants. Remove the offsets with a sharp knife when they are 3-5cm (1-2 inch) across. Place each little rosette in a small pot of very sandy potting mixture (one part soil-based mixture to one part coarse sand) and keep it in a spot where it gets medium light, watering it just enough to keep the rooting mixture from drying out until renewed growth indicates that the offsets has rooted. The plant can then be treated as a mature Dyckia fosteriana and it should be removed carefully into a larger pot of recommended potting mixture for adult plants after their roots have covered the surface area of the rooting pot. Problems: The most common disease problem is rotting off a plant because it was over watered during the winter. Note: Plant has spines and sharp edges; use extreme caution when handling. Although Dyckias have no internal water storage tissue like true succulents, they are xerographic and survive long periods without water by going dormant. Their rosette of thick succulent leaves will eventually wilt, but recovery is rapid when watering is resumed. 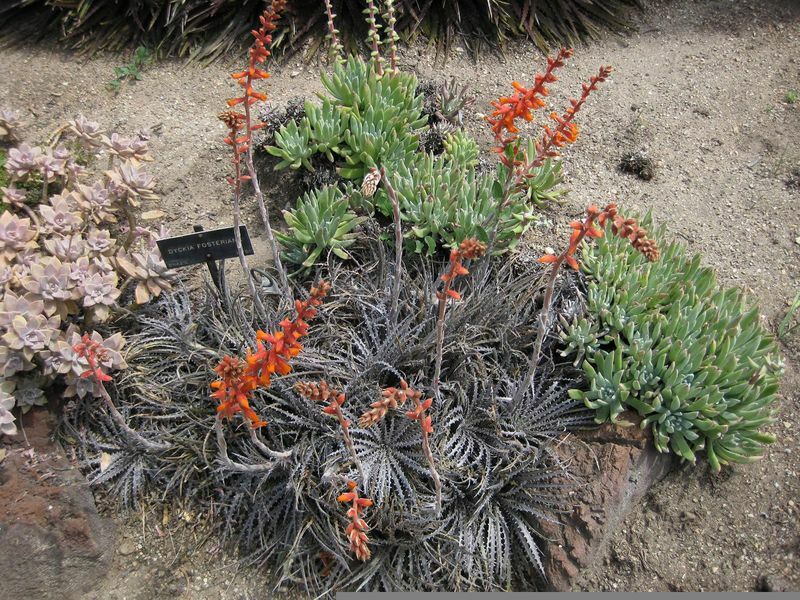 Uses: Dyckia fosteriana is drought-tolerant, thus it is suitable for xeriscaping. Dyckia fosteriana are tough and grow well with other succulents. 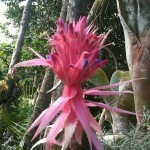 It is one of the best Bromeliads to use for landscaping. It is a distinguish plant to be used in beds or borders. Also it is suitable for growing in containers, thus is a hardy indoor plant. Distribution and habitat: Guzmania lingulata is an evergreen perennial plant, native to tropical wet and humid forest from Central and South America. 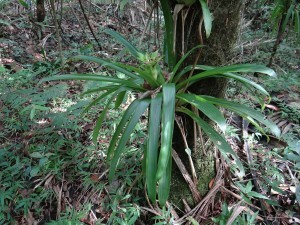 Some of Guzmania lingulata grow terrestrially, but most of them are epiphyte in their natural habitat, growing on trees and rocks. 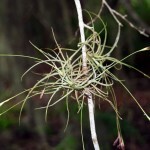 These epiphytes do not cause any damage to their host, as their roots act primarily as an anchor rather than an organ which extract water and nutrients from the host. Guzmania lingulata only bloom a single time. As the plants grow by adding new leaves from the center, it becomes impossible to continue growth after flowering since the inflorescence blocks new leaf growth. The plants direct their energy into growing new vegetative offsets (pups) from growing buds at the base of the leaves. Description: Guzmania lingulata is a quite a variable species; individual specimens differ considerably in some respects. Characteristic of the species are smooth green leaves 45cm (18 inch) long and 2cm (0.8 inch) wide, with a flower stalk up to 30cm (12 inch) long bearing small yellow flowers in the centre of a cup-shaped or funnel-shaped flower head of 4cm (1.5 inch) long crimson bracts. The leaves come together to form a star shape in the middle. Perhaps Guzmania lingulata is most famous for its brilliant pink or red flower bracts, but also can be found in shades of yellow and orange depending on the variety. What appears to be the flower on the plant is actually a grouping of modified leaves, called bracts. They are green at the beginning and little by little they start to colour in bright colours depending on their variety. These bracts can last for about 5 months. The true flowers do not rise above the bracts, having a brief couple of days blooming period. 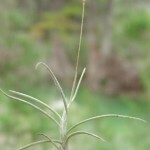 Once the true flowering has taken place, the plant begin to wither and dies, but before dying it will produce offsets that grow at the base of the plant. 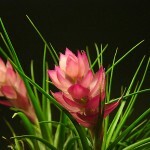 Guzmania lingulata reaches its maturity in about 3 or 4 years, period of time after that it will to be able to flower. Guzmania lingulata grows about 30cm (12 inch) high and 45cm (18 inch) wide. Houseplant care: Cut away spent inflorescence to look tidy and divert the plant’s energy to producing more plantlets. If necessary, trim back the leaves of the parent plant to allow freer growth of their pups. Light: Guzmania lingulata like bright filtered light. They will not flower if they are too far from a window. Temperature: Give these plants temperatures above 18°C (64°F) with high humidity. Stand the pots on trays of damp pebbles and mist-spray the foliage every day. 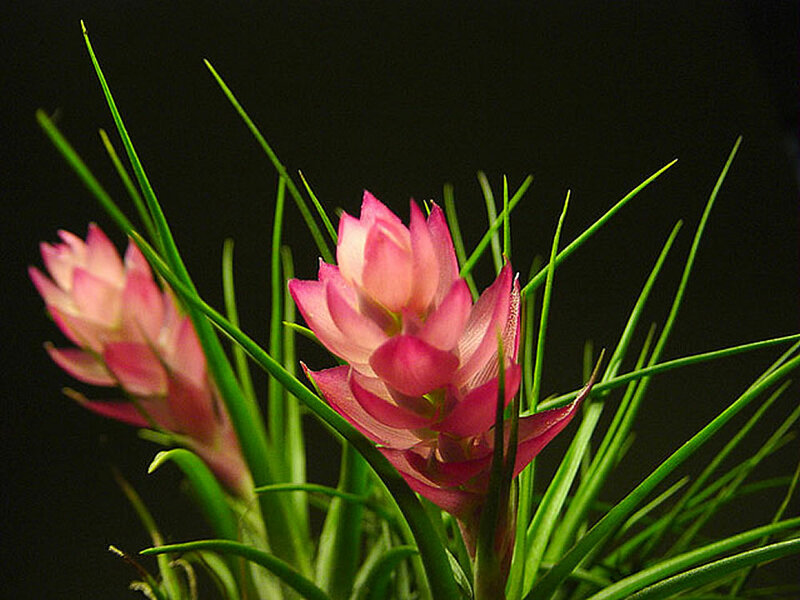 Be especially careful during the winter not to let Guzmania lingulata become too cold and dry. To increase humidity place the Guzmania lingulata near other plants or in parts of the house that are naturally more humid such as the bathroom or kitchen. Water: Water moderately and mist regularly in summer. Outside the flowering period the rosette should be kept filled with water. Change water every 3 to 4 weeks to keep it from rotting. Use soft water. Never put water in the bracts or flowering portion of the plant. It will shorten the life of the flower. Fertilising: Apply standard liquid fertiliser every two weeks not only to the potting mixture but over the foliage and into the central cup. 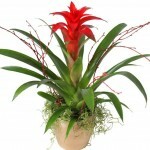 Potting and repotting: Use the potting mixture recommended for bromeliads. Since these plants have little root, 7-10cm (3-4 inch) pots should be large enough. If a plant needs more room, move it into a pot at least one size larger in spring. Note that Guzmania lingulata are usually top heavy, so be sure to anchor the pot well with heavy rock on the bottom or use a heavy pot. 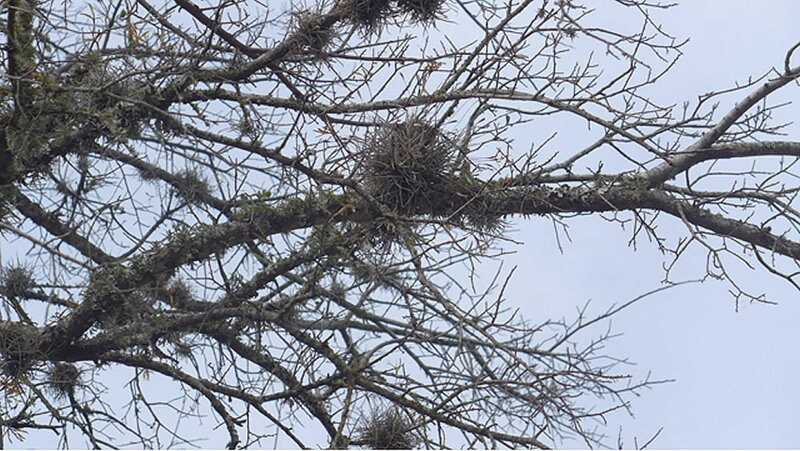 Bark Mounted: Because they are epiphytes, Guzmania lingulata do not require soil to grow and sometimes is refereed as a air plant. 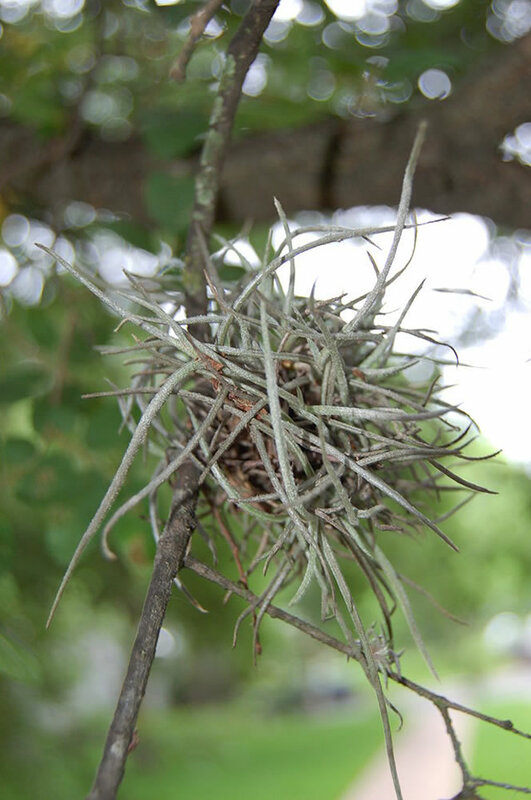 When cultivated as an epiphyte the plants are mounted on a piece of bark or a branch (e.g. Taxus or Thuja) and the roots are wrapped in Sphagnum moss. 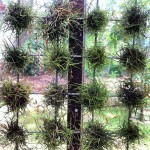 When grown as an epiphyte misting daily usually is sufficient. Use soft water and mist the plant in the early morning if it possible. Keep the center of the plant filled with water. Empty the center or cup of the plant every couple of weeks and replace the old, stale water with fresh water. Keep the plant barely moist (no misting) in winter. Garden Culture: Guzmania lingulata prefer a sunny to half-shady situation on peat and sand moist soil. They are hardy to hardiness zone 10. In summer the plants prefer protection from hot midday sun. Water regularly. Keep the center of the plant filled with water but allow the soil to dry out between each wetting. Their centers are kept full of water. They grow best in high humidity but tolerate drier air. Do not overwater them. Fertilizing helps them grow bigger, mature faster, and produce larger inflorescences. Propagation: In spring cut offsets from the parent, but not before the offsets are 8cm (3 inch) long. Insert each offset in a 5-6cm (2-2.5 inch) pot of bromeliads mixture, keep it bright filtered light and water it moderately. When the offset is well rooted (in about six months) move it into a pot one size larger and treat it as a mature Guzmania lingulata. These plantlets mature and bloom within a few years. Brown patches on the leaves may be caused by direct exposure to sun. Brown tips on the leaves usually indicate insufficient humidity in the air. In their natural habitat, most Guzmania plants grow on the branches of other trees, not in soil, and they are prone to root rot. The main pests of this bromeliads are scale and mealy bugs. Scale will look like little round dots covering the top or bottom of the leaves. Mealy bug will look like a white cottony patch. Treatment: For small outbreaks, these can both be treated by wiping over them with a cotton swab dipped in rubbing alcohol. For more wide spread infestations, try mixing a little mild dishwashing detergent or baby shampoo with water and spraying the infected plants. The soap will coat and suffocate the insects. It is recommended to rinse the plants off with clean water to make sure the pores on the leaves are open so the plant can breathe. DO NOT use heavy oil based insecticides as these are likely to choke the plant as well. 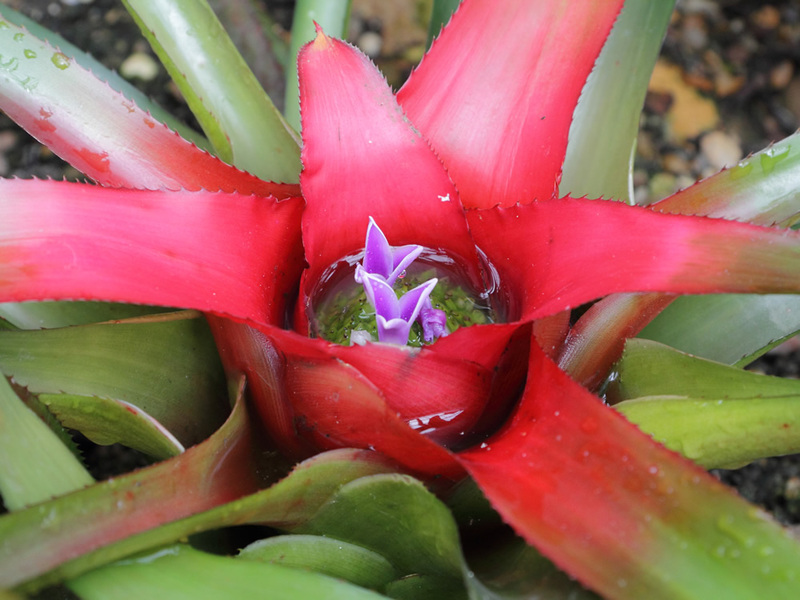 Notes: Bromeliads can be forced to flower by exposing it to ethylene gas that can be emitted from a ripen apple. Place the plant inside a clear plastic bag with a ripe apple for two to three days. Depending on the type of plant, flowering will begin in six to fourteen weeks. Guzmania lingulata cardinalis is a little larger than the species plant and has bracts of an even stronger red. Guzmania lingulata minor is growing less than 30cm (12 inch) tall and has leaves only about 10cm (4 inch) long and a cup-shaped flower head on a short, stumpy stem carrying variably coloured bracts. Availability: Guzmania lingulata is usually sold at the beginning of its flowing period in mid summer to early fall and the flower will last for many months. 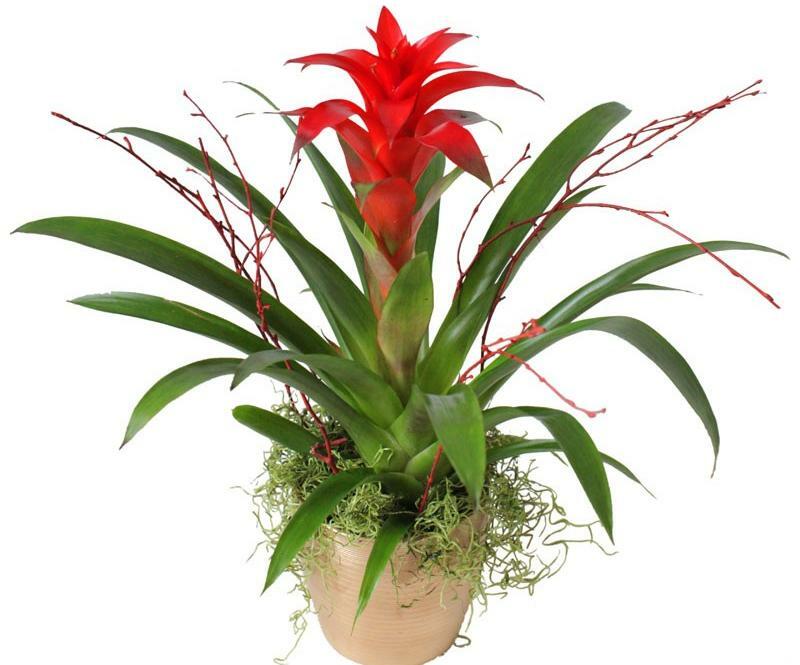 Uses: Guzmania lingulata are used very successfully in indoor commercial situations such as shopping malls and office buildings. They add dazzling color and a tropical feel to any room. Get one for the office, too, and make a bold statement. It grows well under the fluorescent light of offices and is wonderfully stunning tabletop plant.. Grown outdoors, it will be most ideal in front-of-the-border grouping in garden beds or borders, as well as a landscaping plant for rock gardens. Guzmania lingulata can be grown for cut flowers, used in live floral arrangements or to enliven shaded patios and gardens during the warmer months. It can be grown as an epiphyte mounted on a piece of bark or a branch. 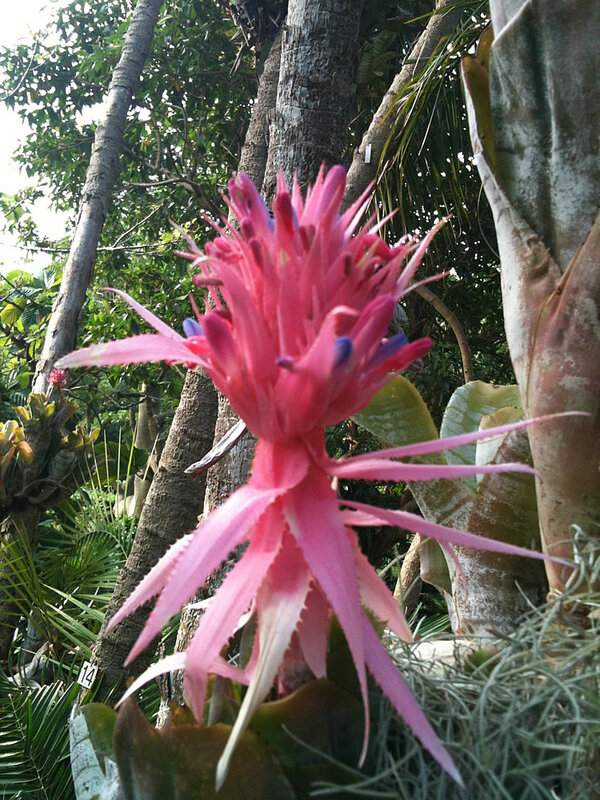 Distribution and habitat: Aechmea fasciata is a species of flowering plant in the bromeliad family, native to Brazil where was found in mountain forests at about 550m (1,800 feet) above sea level. Aechmea fasciata is epiphytic plant, which means that in the wild it grow on other plants – usually trees – but is not parasitic upon them. It is air-feeder, collecting nourishment from water and decaying mater in the upturned cup of their leaves. Aechmea fasciata do not really use their roots other than for anchoring. Aechmea fasciata have adapted to their environment and are always arranged in a rosette, shaped to capture and hold the water. The Aechmea fasciata flower only mature and only once from each rosette, after which the rosette slowly dies. The foliage and colourful inflorescence remain decorative for several months after the small blooms have faded, however. During this period offsets appears around the base of the old rosette. Description: Aechmea fasciata has arching, grey-green, spiny leaves which are cross-banded with sprinkling of white powder and can attain a length of 60cm (24 inch). When fully mature (usually after three or four years’ growth), the plant send up strong flower stalk bearing a pink inflorescence up to 15cm (6 inch) long. The large inflorescence consists mainly of bracts from between which emerge small, pale blue flowers that soon turn red. These disappear quickly, but the pink bracts remain decorative for up to six months. 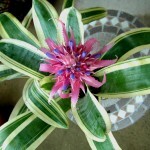 Houseplant care: Aechmea fasciata is the most popular Aechmea. 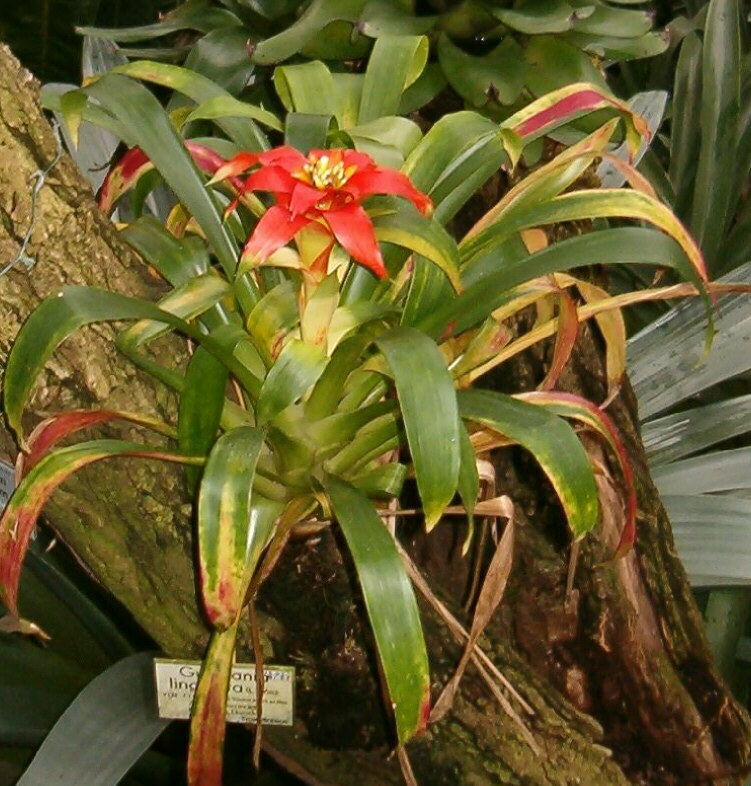 Many indoor gardeners stimulate natural conditions by growing these bromeliads on attractive ‘epiphyte branches’. After a Aechmea fasciata has flowered, the offsets can be removed for propagation. In case that propagation is not desired, make room for the new rosette to develop in original pot. This is easily done by using a sharp kitchen knife to cut off the old rosette at the lowest possible point when it has become shabby and started to wither. Pots containing two or more rosette can be exceptionally decorative. Aechmea fasciata is an easy to grow plant. Light: Potted Aechmea fasciata grow best in full sunlight. They will not flower successfully if kept at a distance from a sunny window. 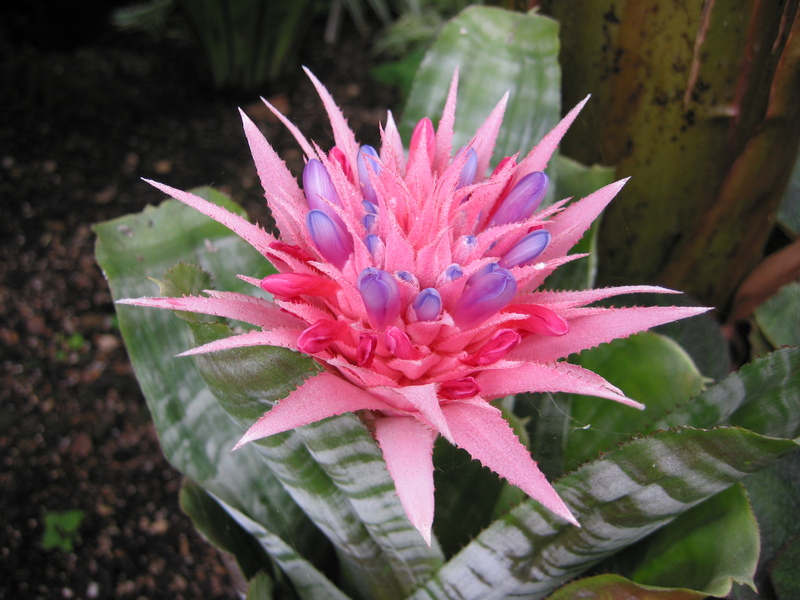 Temperature: Aechmea fasciata like temperatures of over 15°C (59°F), coupled with high humidity throughout the year. Pots should be stood on trays of moist pebbles. 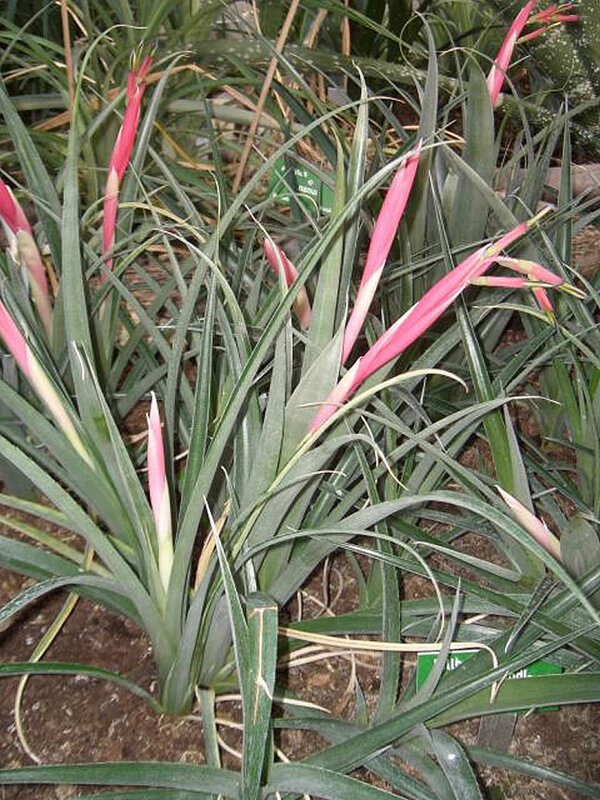 Aechmea fasciata tolerate cools positions and dry air and it can survive short periods of cold. Aechmea fasciata tolerates colder temperatures than most bromeliads. Watering: Water moderately, enough to make the potting mixture thoroughly moist, but allow the top 1cm (0.5 inch) to dry out between waterings. In addition, make sure that the cup-like centre of the plant have a constant supply of fresh water. In hard-water areas it is advisable to put Aechmea fasciata out in the soft rain from time to time (but only in mild periods); hard water disfigures the leaves by building up lime deposits. Fertilising: Except in midwinter, provide half-strength liquid fertiliser once every two weeks. Apply the fertiliser not only at the roots, but over the foliage and into the central cup. Potting and repotting: Use an equal-parts mixture of leaf mold, peat moss and coarse sand. Aechmea fasciata do best in small pots. The 13cm (5 inch) pot size suffices for a mature Aechmea fasciata. Repotting, if done at all, should take place just as new growth begins. Gardening: Within its hardiness zone, Aechmea fasciata is growing best in partial shade in moisture-retentive but well-drained soil. It makes a handsome ground cover. Place individual plants about 45 to 60cm (18-23 inch) apart for an effective ground cover. 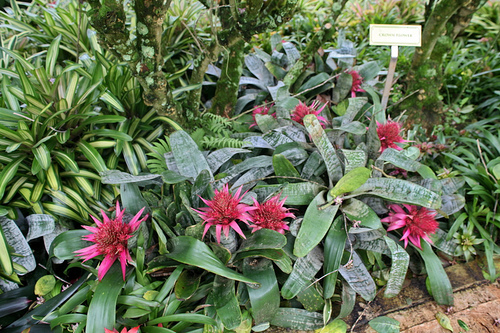 A ground cover or mass planting of Aechmea fasciata in front of a green-foliaged shrub grouping which branches to the ground make a nice, bright accent for a partially shaded spot. Aechmea fasciata is a good container plant in a cool climate and can be taken inside before the first frost. Always, when grown in the garden choose a spot in dappled shade under trees. Propagation: When the offsets that appears around the base of the plant are about half the size of the parent plant, they can be cleanly detached – preferably in spring – and potted in 5-8cm (2-3 inch) pots of the recommended potting mixture for adult Aechmea fasciata. If an offset has already produced roots of its own, they should be retained. For roughly the first four months, each little plant should be kept in bright but filtered light and should be watered very sparingly – just enough to keep the potting mixture barely moist. When it is well-established, the young Aechmea fasciata can be moved into direct sunlight and be treated as a mature specimen. Brown tips on the leaves may be due to insufficient water in the vase of the plant, lack of humidity in the atmosphere or to the use of hard water. Overwatering of the compost may cause rotting – keep plants moist but never wet. Scales and mealy bug may attack Aechmea fasciata. Aechmea fasciata‘s problems include mosquitoes which may breed in the trapped water in the leaves. To avoid this, keep clean the water from the leaves vase. 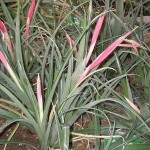 Use: Plant enthusiasts grow Aechmea fasciata for its ornamental leaves and long-lasting pink blooms. 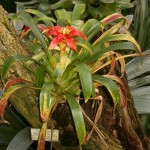 It is is often the first plant in any bromeliad collection. 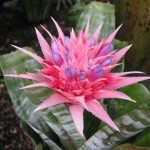 Aechmea fasciata can be successfully grown epiphytically or without soil, with moss around its roots and wired to the branches of rough-barked trees where its cupped rosette will catch needed water. Along with other bromeliads, Aechmea fasciata look attractive on an epiphyte branch, anchored down by heavy stones. Also, Aechmea fasciata makes a handsome mass planting, ground cover or container plant, above-ground planter. 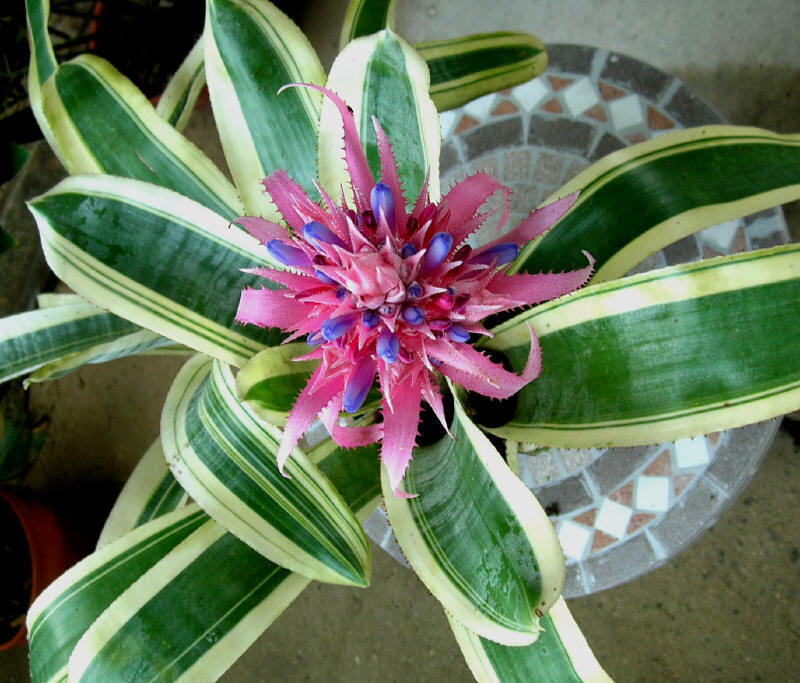 Aechmea fasciata will purify the indoors air by removing formaldehyde from it. Aechmea fasciata Albomarginata has cream-coloured bands bordering each leaf. Aechmea fasciata Variegata has leaves with length-wise cream stripes. Availability: Aechmea fasciata is widely available throughout the year, usually sold as flowering mature plant. 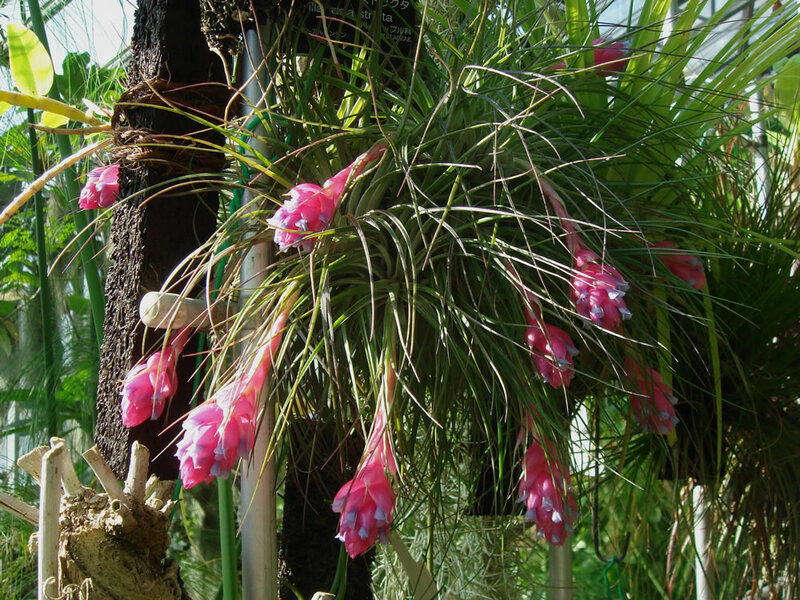 Distribution and habitat: Tillandsia cyanea is a species of flowering plant in the bromeliad family. It is growing to 10cm (4 inch) high by 40cm (16 inch) wide and has stemless rosettes of thin, recurved leaves and paddle-shaped spikes of 20 pink bracts with violet flowers, in spring and autumn. 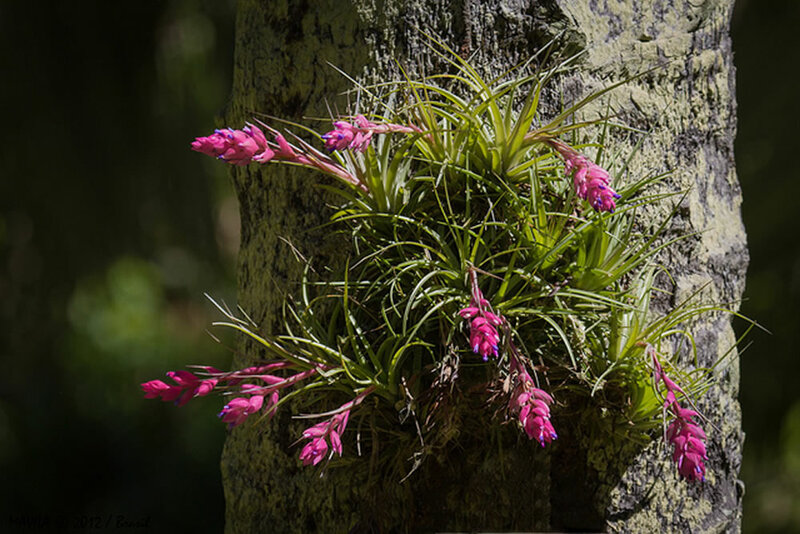 Tillandsia cyanea are perennial epiphytes in their native rainforests of Ecuador and have small roots, mainly used for anchoring themselves on trees. Because the roots do not drink up water, these tree-dwelling plants gather moisture and nutrients through their leaves. With a minimum temperature of 7°C (45°F), Tillandsia cyanea is often cultivated as a houseplant in temperate regions. 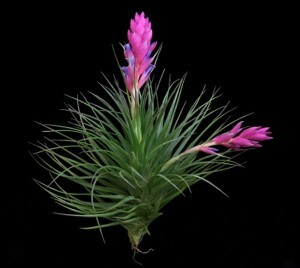 Description: Tillandsia cyanea has many 30-45cm (12-18 inch) long and 1-2cm (0.4-0.8 inch) wide leaves. These narrow, pointed-tipped leaves are arranged in a loose rosette. Their colour is grey-green with reddish brown, lengthwise stripes on the underside. A 5-8cm (2-3 inch) long flower stalk appearing from the centre of the mature rosette carries a fan-shaped flower head 10-15cm (4-6 inch) long and 5cm (2 inch) wide. This hard flower head , which last for up to 10 weeks, is composed of a number of smooth, overlapping, rose-coloured bracts. The actual flowers, which appear singly from the notches formed on the edge of the flower head by the overlapping of the bracts, are tubular flaring out into three broad petals. Flower colour is bright violet-blue and each bloom measure about 5cm (2 inch) across. 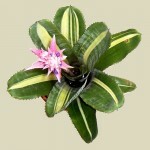 As with most with bromeliad rosette, the rosette flowers only once and then gradually dies. Offsets are produced from leaf axils and these may be either used for propagation or left in the pot after the withered rosette has finally been detached. Houseplant care: After flowering old bracts can be removed, new plants will then form. 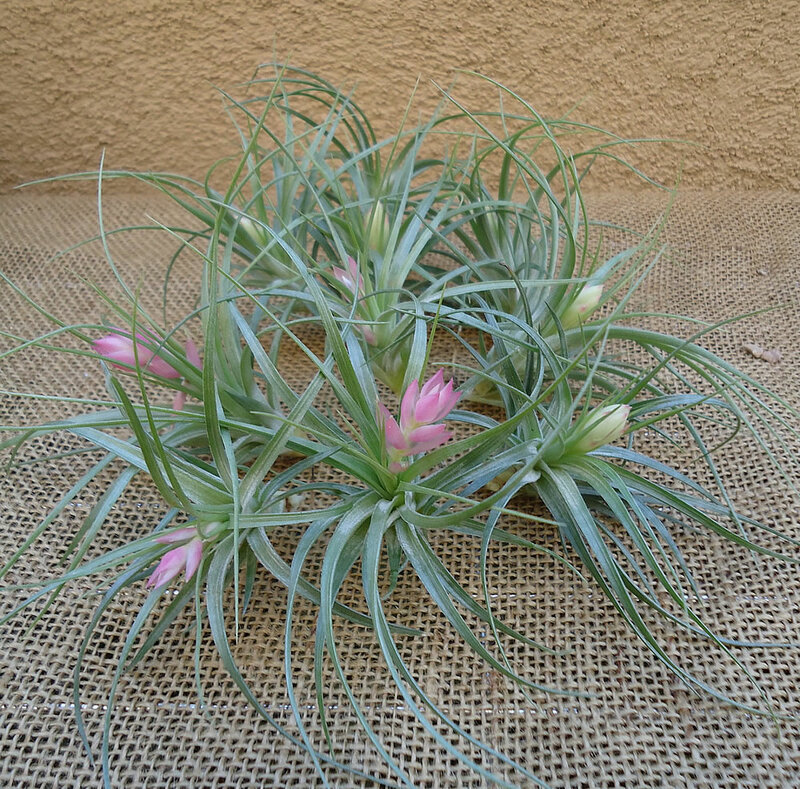 Tillandsia cyanea plants will bloom when they reach maturity, usually in 2-3 years. 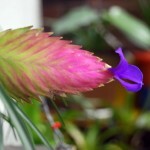 Like other bromeliads, they will bloom once then produce offsets. 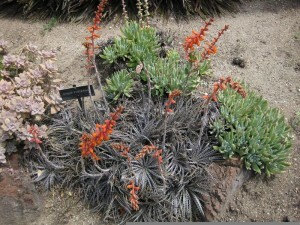 Propagating the offsets make the collection of plants to last many years. It is important to clean old dried leaves and flowers and watch the plants for insects attacks. 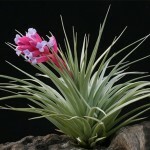 Light: Tillandsia cyanea used as house plants do best in bright filtered light (a translucent blind is a useful filter). 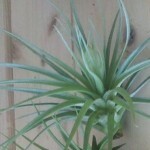 Keep Tillandsia cyanea in a well ventilated place. 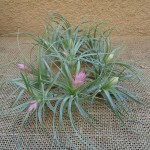 Tillandsia cyanea will grow well, but will not flower if kept in dark. 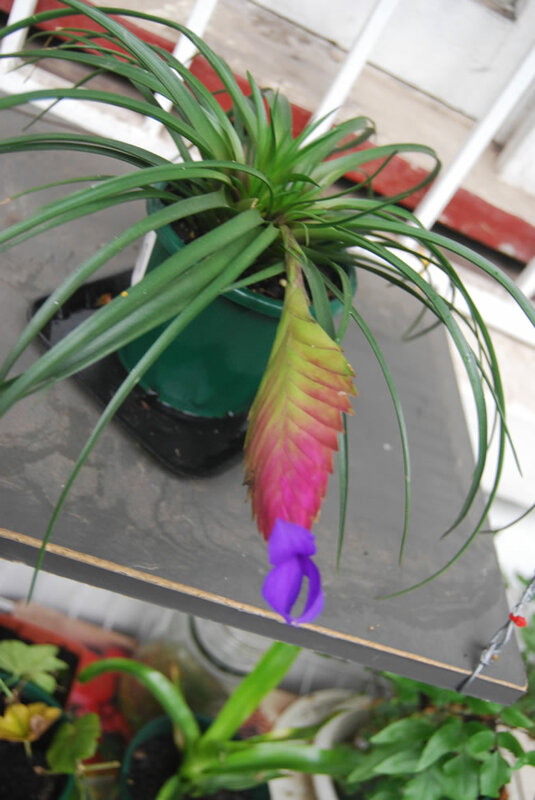 Temperature: Tillandsia cyanea will grow actively throughout the year if the temperature is kept above 15°C (59°F), being suitable for warm environments with temperatures that does not drop below 13°C (55°F). 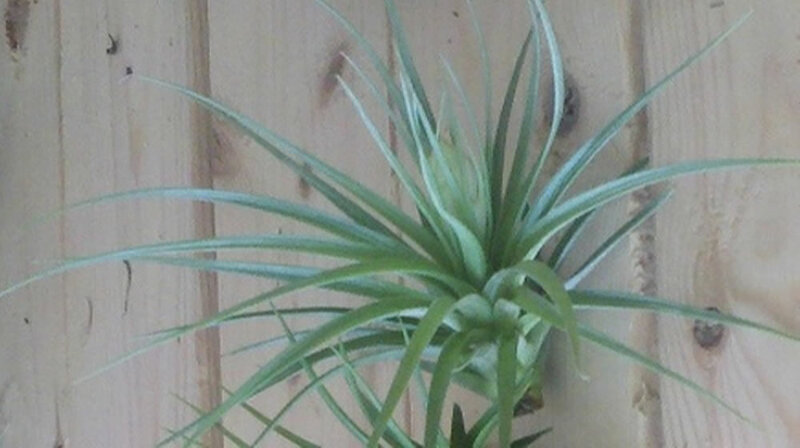 For increased humidity, it is a good idea to stand the potted species of Tillandsia cyanea on trays of moist pebbles and spray mist them two or three times a week. 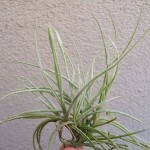 Water: The negligible roots of Tillandsia cyanea need very little water. If the foliage is most sprayed regularly as advised above, enough water will seep into the mixture. If possible use rainwater or filtered tap water for misting Tillandsia cyanea. It is generally recommended to water the leaves morning and evening, there would be no problem if they are watered only once a week or even once in 10 days. 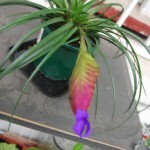 Fertilising: Give a half-strnght dose of standard liwuid fertiliser to potted Tillandsia cyanea once a month. 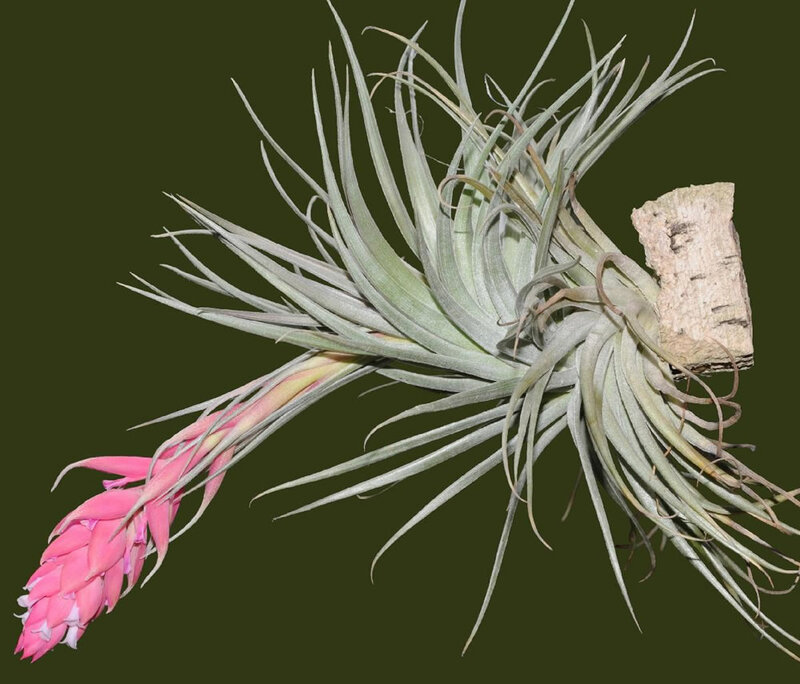 Potting and reppoting: For Tillandsia cyanea use one of the potting mixtures recommended for bromeliads, a potting mixture that is porous, spongy and almost lime-free. Satisfactory mixture often consist of equal parts of coarse leaf mould and peat moss or equal parts of free-lime soil-based mixture and peat moss. These plants will flower from offsets in 10cm (4 inch) pots and do not need to be moved to bigger ones. Propagarion: Remove offsets of Tillandsia cyanea from the parent plant at any time after their leaves have attained a length of 8cm (3 inch). Plant each offset in a 5-8 cm pot containing an equal-parts mixture of peat moss and coarse sand or perlite and enclose the whole in a plastic bag or propagating case. When roots have developed, treat the young plant as a mature specimen. 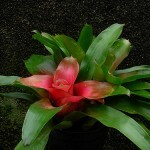 Transfer it into a 10cm (4 inch) pot of standard bromeliad mixture about six months after the start of propagation. 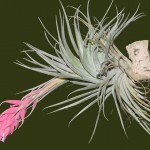 Problems: Tillandsia cyanea is generally disease free. Aphids may be a problem. Treatment: Remove and destroy badly distorted plant growth. Keep the plants clean and use pesticide to combat the insects. Tillandsia Cyanea ‘Paradise’ is the best form of Tillandsia Cyanea ever produced; flower bracts last up to 6 months in colour and produce 5cm (2 inch) blue flowers over a 6 week period. Uses: These curious plants may be grown outdoors as long as temperatures do not drop below 7°C (45°F). 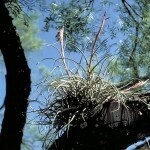 It can be mounted on a piece of coarse bark, in the crotches of trees or among hanging baskets of orchids. Unlike other plants in the air plant genus (Tillandsia spp. 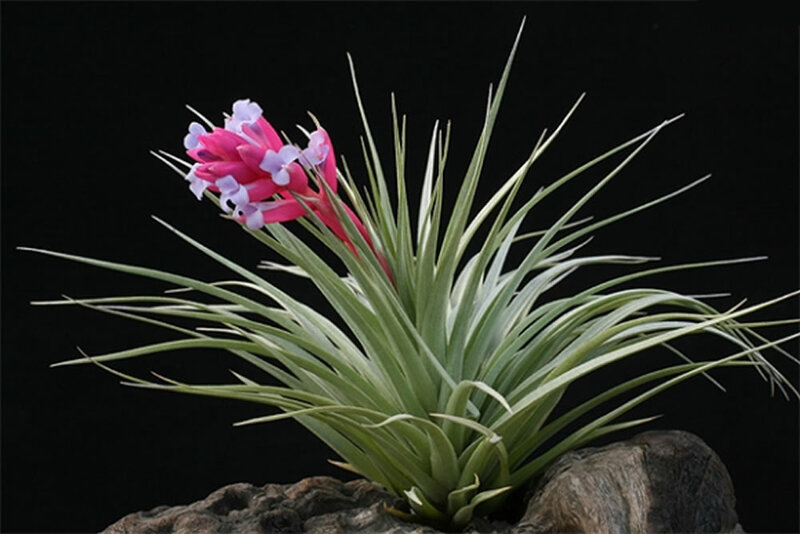 ), which grow without soil by attaching themselves to trees and branches, Tillandsia cyanea may be grown directly in a container with potting soil. 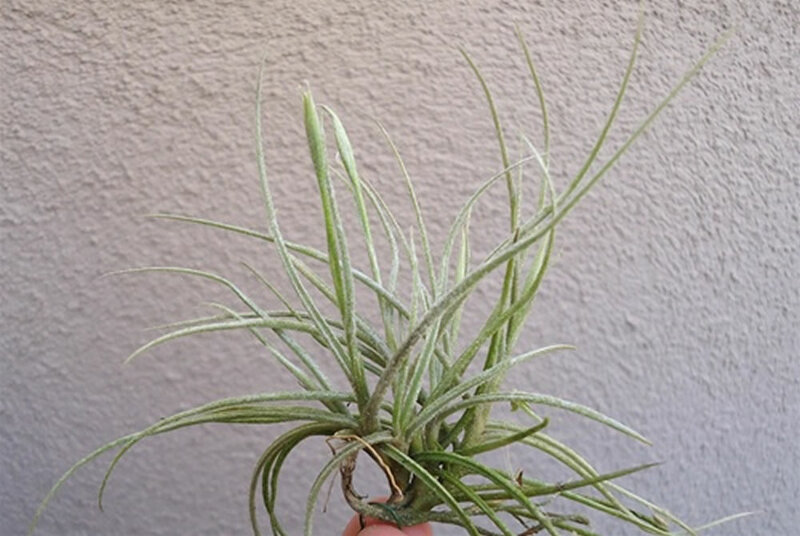 Interesting facts: Tillandsia is a large group of evergreen perennials that may be either epiphytic, terrestrial or rock-dwelling and are a member of the bromeliad family which contains over 3,100 species, as well as forming part of the tillandsioideae subfamily. 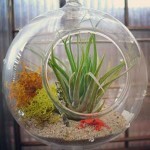 It is in the tillandsia genus (air plants), which contains around 540 species. 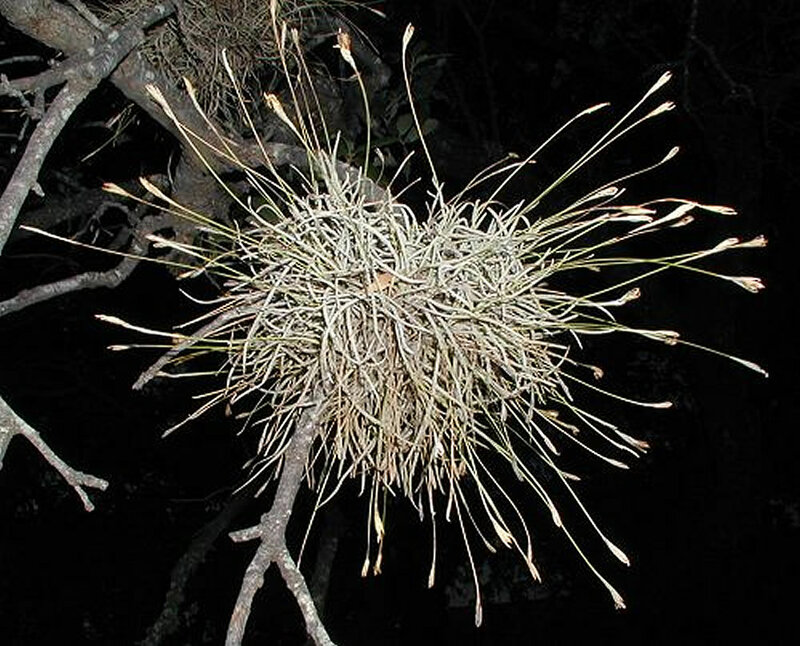 When tillandsia attaches to a tree the host plant is not damaged by its presence, as tillandsia takes its nutrients from moisture in the air, not the tree itself.